Noma = Nordisk + Mad = Nordic + Food. A simple name reveals a simple aim. 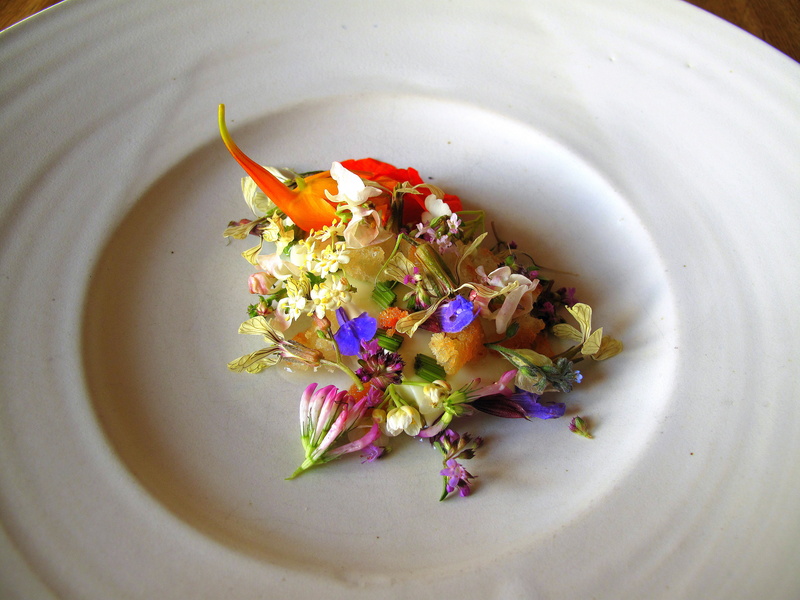 There is a movement (for lack of a better term) in gastronomy towards a cuisine that is, above all, natural, but also generally fiercely local, seasonal and with a focus on superior ingredients. It is a style that was enabled by institutions such as Bras, l’Arpège and Mugaritz and is now embodied by the likes of Ubuntu, Mirazur and noma. These ‘New Naturals’ are unique restaurants offering a special insight into the terroir they occupy. 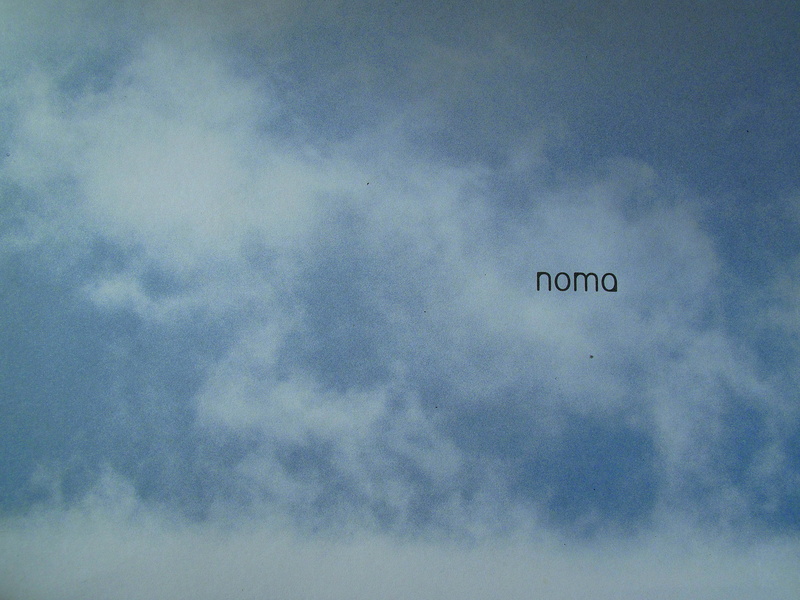 It is the last of those, noma, which concerns this account and its story begins with Claus Meyer. Little known outside of Scandinavia, Meyer is Denmark’s most famous foodie. First television chef, now restaurateur, business man and farmer, this venture is his vision. 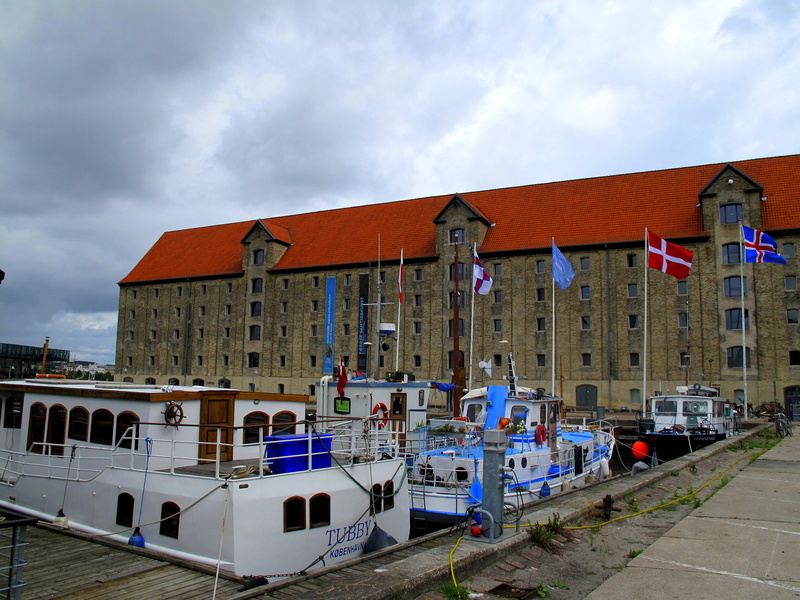 For more than two centuries, the Grønlandske Handels Plads in Copenhagen’s Christianshavn quarter was a busy centre for trade with Iceland, the Faeroe Islands and Greenland. 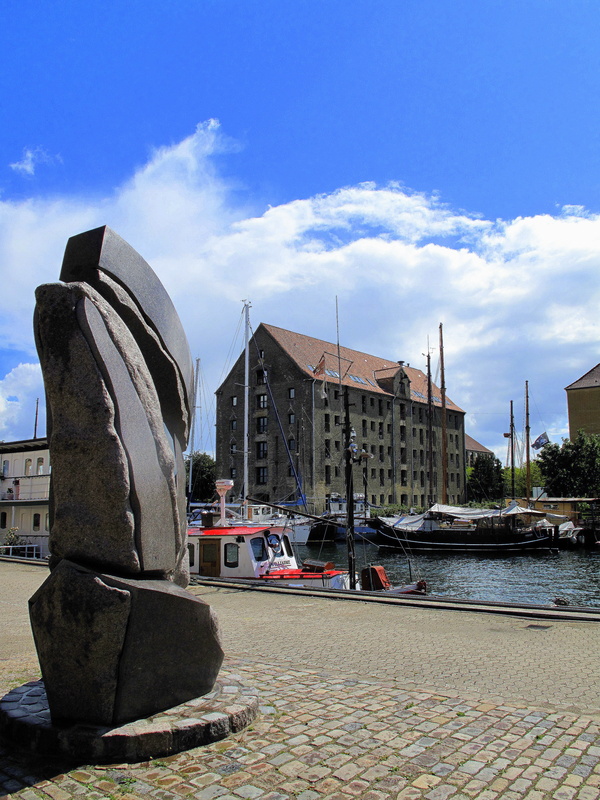 Hence, it was common for immigrants from these lands to take their very first footsteps upon Danish soil here; thus it was considered, at the turn of this century, a fitting site for what would become Nordatlantens Brygge – North Atlantic House – a shared address for these northerly neighbours. To accommodate this grandiose project, one of the harbour’s most impressive structures was selected – the five-story, seven-thousand metre-squared former warehouse that resides at the end of the Strandgade. As Pedersen’s replacement, Meyer approached Paul Cunningham. The Englishman was more than curious, but had already agreed to open a new restaurant in the Tivoli Gardens – a deal he was unable to free himself from. In his stead, he recommended two others. One was Bo Bech, who had just ended his partnership with Jan Hurtigkarl. The other was René Redzepi. Upon graduating, he joined Pierre André (1*) in the Danish capital, where he spent four years studying classical French cuisine. 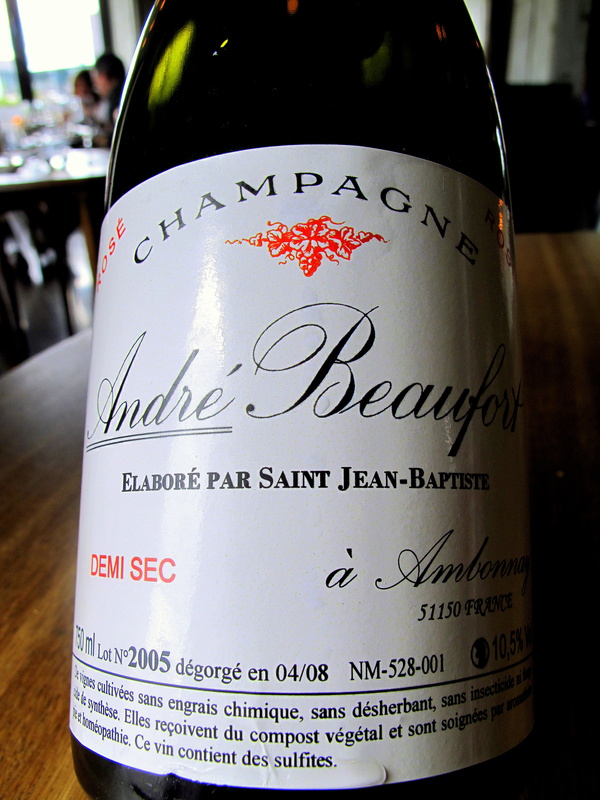 This inspired him to make the move, in 1998, to France and the Pourcel brothers’ Jardin des Sens (3*) in Montpellier. Disappointed to find ‘a lot of shouting in the kitchen. A lot of aggression,’ he left soon enough. However, before he did that, he visited a restaurant just over the Franco-Catalan border that he had heard great things about; it was in Rosas, it was el Bulli. ‘I was blown away. It wasn’t the specific dishes that did it. It was the sense of freedom. Up to that point I had assumed all grand cooking had to be French.’ He soon returned, but this time to cook; in fact, he was so eager, he worked the 1999 season unpaid. 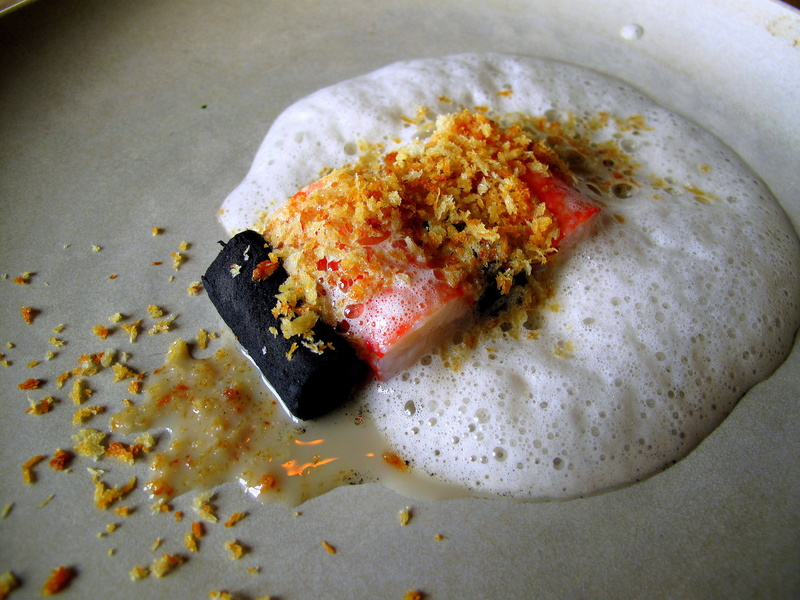 Redzepi spent the subsequent year in miscellaneous consulting positions prior to a summer spell in 2001 at Thomas Keller’s French Laundry, in California. After this, he was back in Copenhagen working under Thomas Rode Andersen at Kong Hans, which is where Meyer found him two years later. 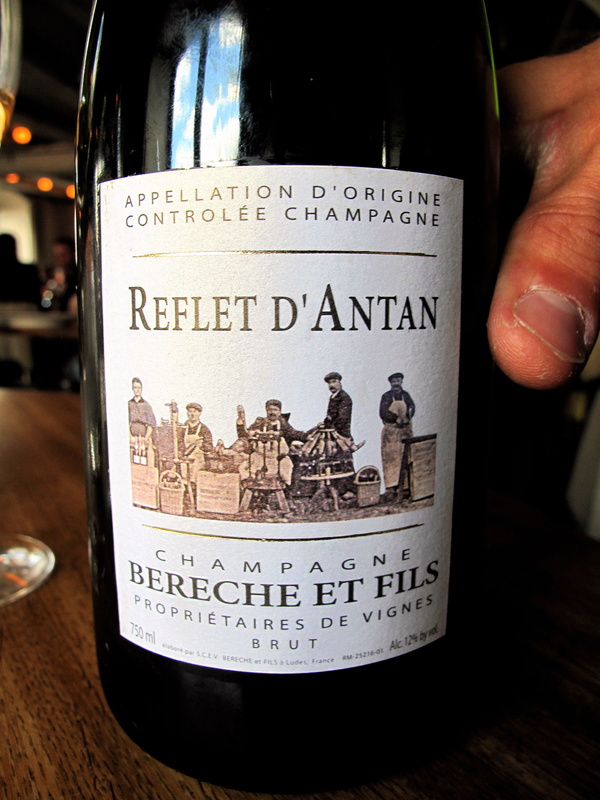 Seemingly keener than Bech, it also quickly became apparent to Meyer that Redzepi’s and his own ambitions were similarly aligned; he therefore offered him the role and a partnership in the business. However, the chef had a condition; he wanted to have an old friend from école hôtelière days – Mads Refslund – join them as a partner and his sous. Meyer acquiesced. The team’s first task was a four-week fact-finding expedition through the North Atlantic; they were seeking new ingredients and new methods native to the Nordic region that they could take back to noma. Their trip was fruitful – treasures they unearthed included huge, forty-five-year-old horse mussels in the Faeroe Islands; biodynamic pearl barley, arctic char and rye bread steamed underground in Iceland; and, in Greenland, six-year-old shrimp, small and fatty capelin and crowberries. 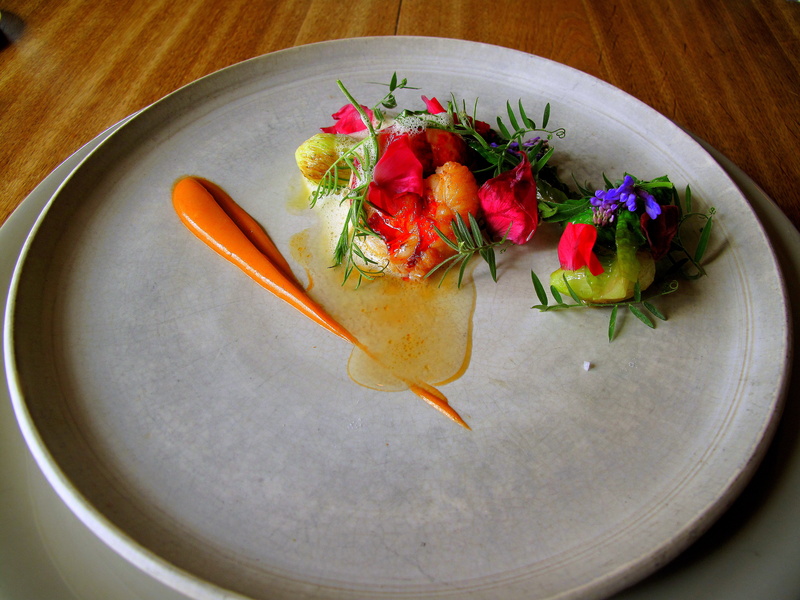 Furthermore, it left an immense impression on Redzepi: ‘Here, where we are, nature is as it wants to be and I began thinking about how to reflect that nature, express it on the plate.’ Once home, they opened noma in November 2003. ‘They called us the stinking whale,’ the chef remembers. ‘Everybody thought Scandinavian cuisine was a joke when we started.’ Coupled with the tremendous difficulty realised importing all the incredible products they had uncovered, the restaurant faced a challenging initiation. But Redzepi was undeterred and less than ten months later had even organised a special symposium to which the region’s leading chefs were invited. At this event, the New Nordic Kitchen Manifesto – a set of ten commandments specially scripted by the chefs – was penned and a quiet gastronomic revolution engineered. Soon people paid heed. Supply lines were secured. Success followed. 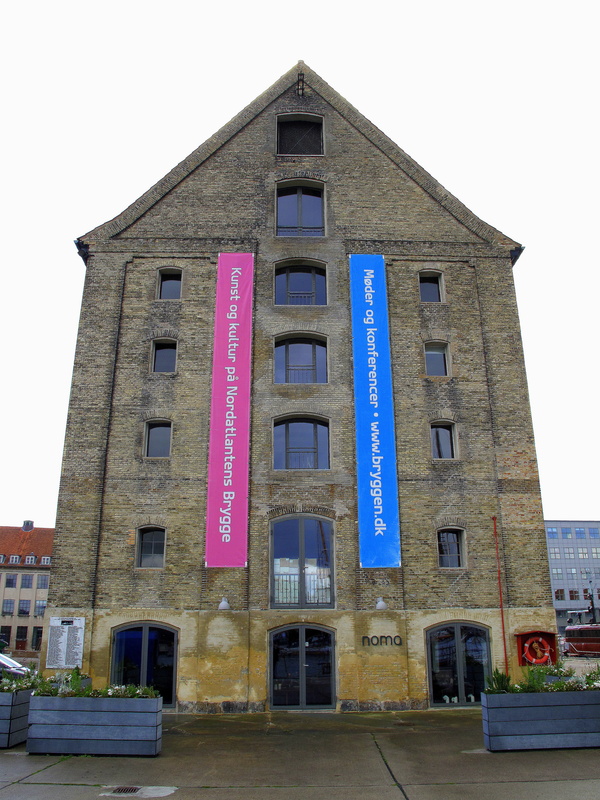 In 2005, noma was awarded its first Michelin star and, having been bestowed an espoir the next year, subsequently won its second in 2007. 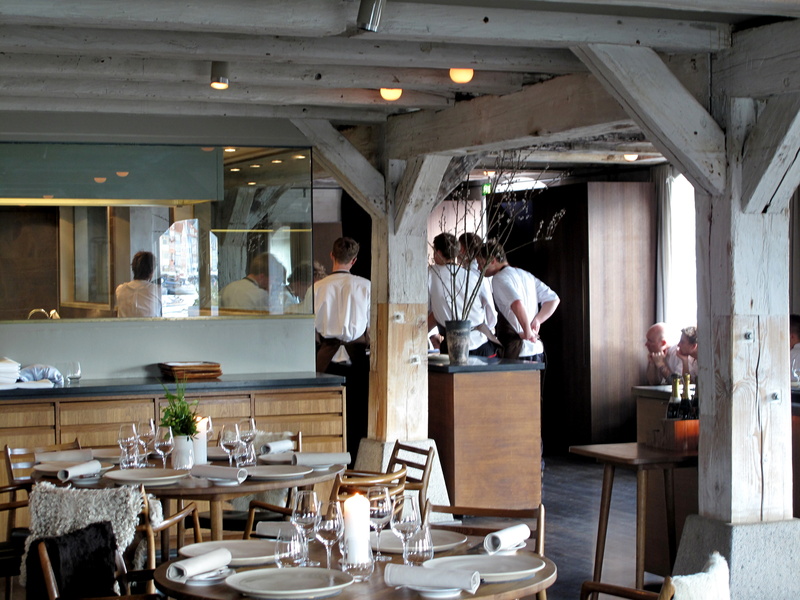 Now Redzepi has a network of producers three times as strong as the average Danish restaurant whilst also employing five foragers to scout the area for new produce. Additionally, the chef was further recognised with his appointment as ambassador for the New Nordic Food program by the Nordic Council of Ministers and also his selection as the president of Denmark’s Bocuse d’Or team. 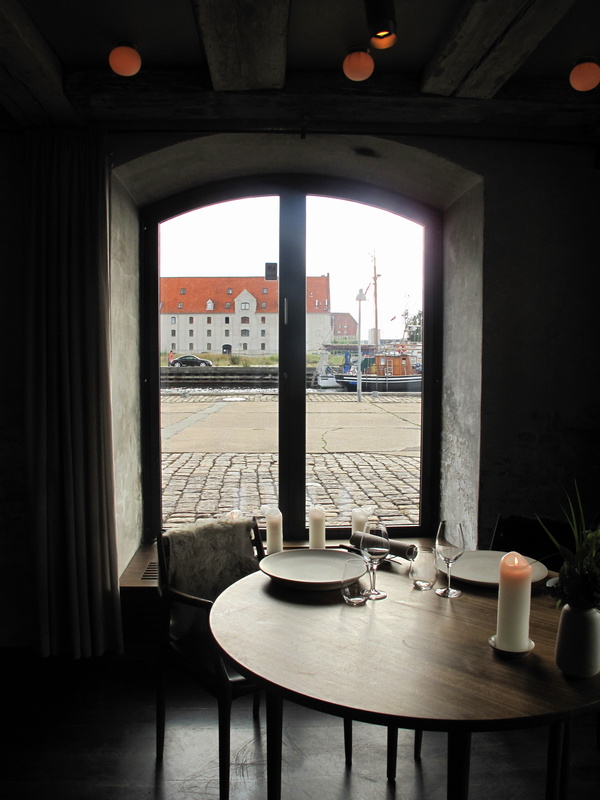 Noma’s address could not be more apt: the restaurant reclaiming Nordic cuisine sits on an island of reclaimed land. 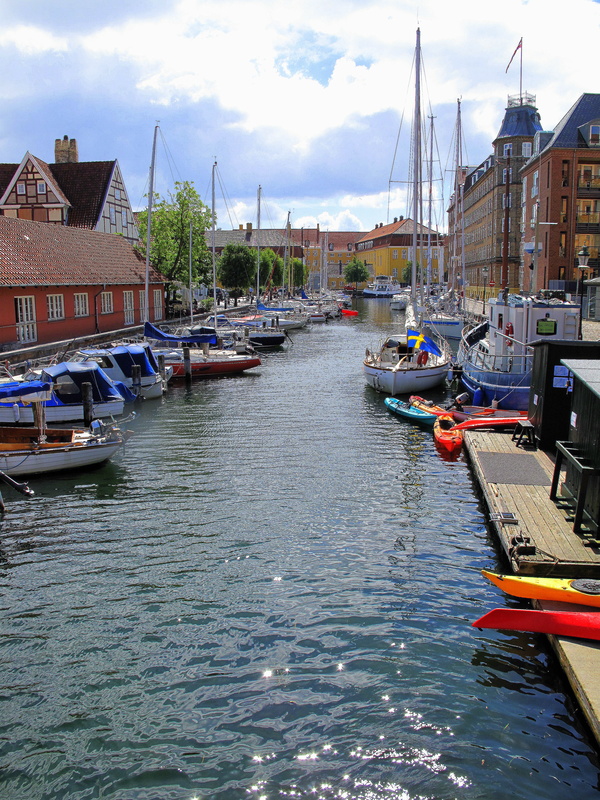 In the early seventeenth century, Christianhavn was created as a merchant town that provided protection to Copenhagen proper. With its canals and tall, bright, multicoloured buildings (and today its bicycles too), the town built by Dutch architects was modelled on the Dutch capital. One hundred years on, this was where the Royal Greenland Trade Enterprise could be found; the focal point for shipping and commerce between Denmark and her former colonies of Iceland, the Faeroe Islands, Greenland as well as Finnmark. Another hundred years later and these same streets were those favoured by Kierkegaard on his long walks – and he certainly liked to walk. 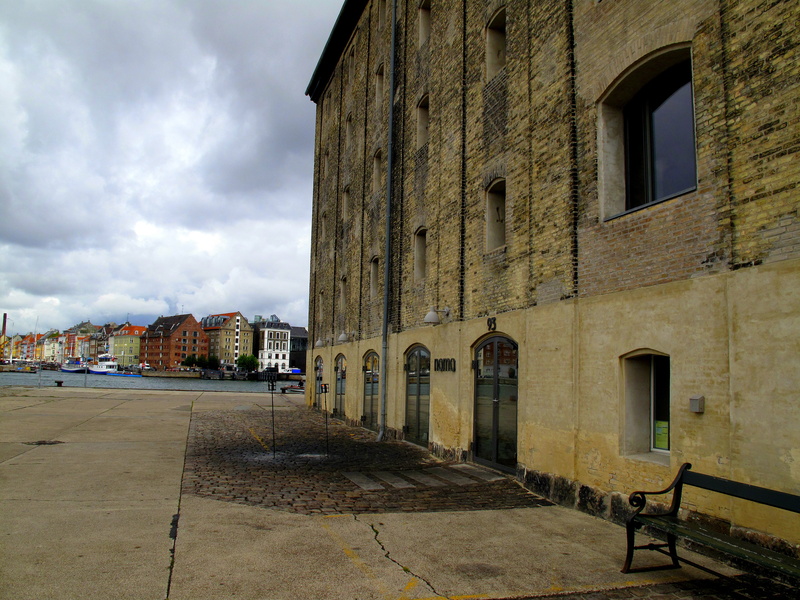 Nowadays, the old warehouses that line the waterfront have been refurbished. This includes the afore-mentioned culture and arts centre, Nordatlantens Brygge which, once housing salted herring, whale blubber and skins, spelt and dry fish, is now home to the Icelandic embassy and permanent representations for Greenland and the Faeroe Islands, along with noma of course. The rough-hewn, mottled gray brick building with pitched red-tile roof and narrow, sandy yellow stucco skirting was constructed in 1766 by master-builder J.C. Conradi. It is a formidable, but beautiful frame for the restaurant. Noma’s entrance itself is discreet and distinguished only by a pair of upright pikes in front of the door, carrying caged gas candles, and the noma name stencilled in three-dimensional, lower-case letters to one side of it. The interior is quintessential Nordic. Created by Signe Bindslev Henriksen, the space marries old-world charm with clean, uncluttered modernism. ‘I knew that this was the place, it had such a warmth about it with its wooden beams. 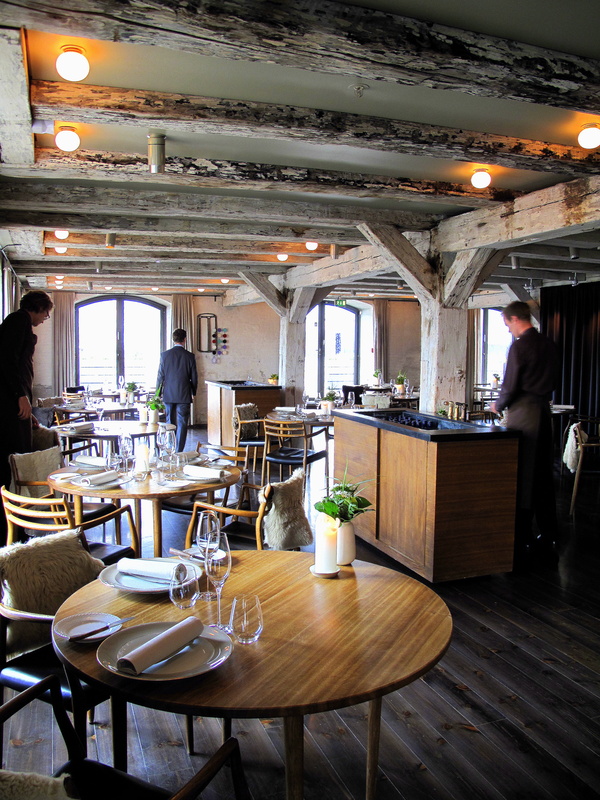 I was sick of luxurious, palatial restaurants,’ tells Redzepi. Indeed, woods dominate. 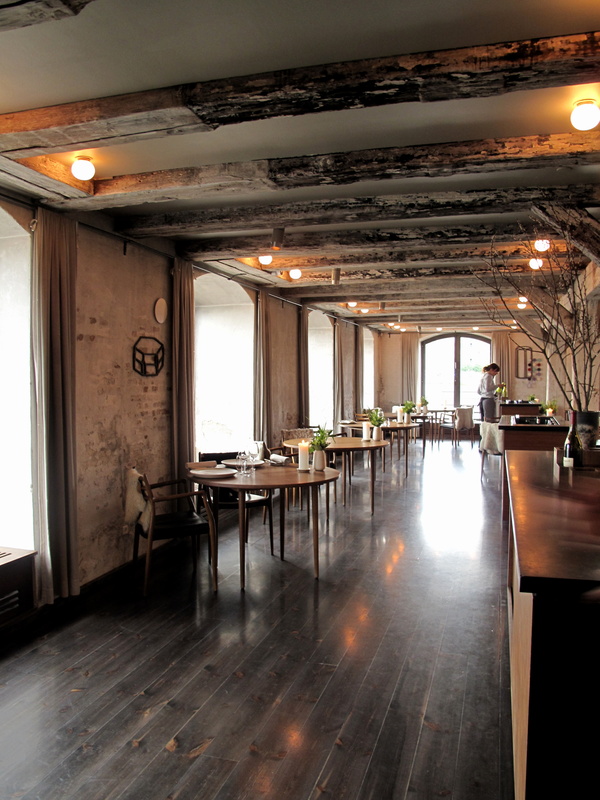 Floorboards of Pomeranian pine; ancient and limed pillars supporting rugged exposed timbers; with grainy, smoked oak tables, seats and serving stations, together form a warm counterweight to the seriousness of the cracking white-washed brickwork walls. Floor-to-ceiling, arched windows set in arched recesses, encircle the space allowing in plenty of sunlight and imparting impressive views out over Københavns Havn. Well-sized tables are well-spaced and surrounded by spindly, sixties-styled Scandinavian chairs; most unusually and authentically, each bears a fluffy, white sheepskin. Extravagant excess is eschewed; naked tables are topped sparingly with Royal Copenhagen china, Spiegelau stemware, wild Danish flowers and a thick-cut candle. Away from the dining area, besides the doorway, stands the more contemporary, stainless steel kitchen which, although behind paned glass, is nonetheless easily accessible by eye. Amuse Bouche 1: Syltet og røget vagtelæg. 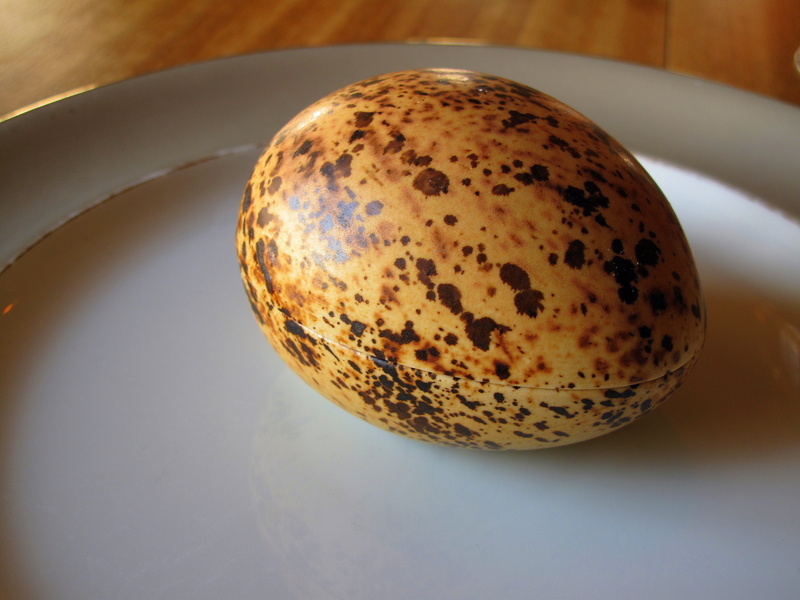 An oversized brown and tan-speckled porcelain egg was placed at the table. Instructed to consume the contents within just ten seconds of opening the container, one lifts the lid. 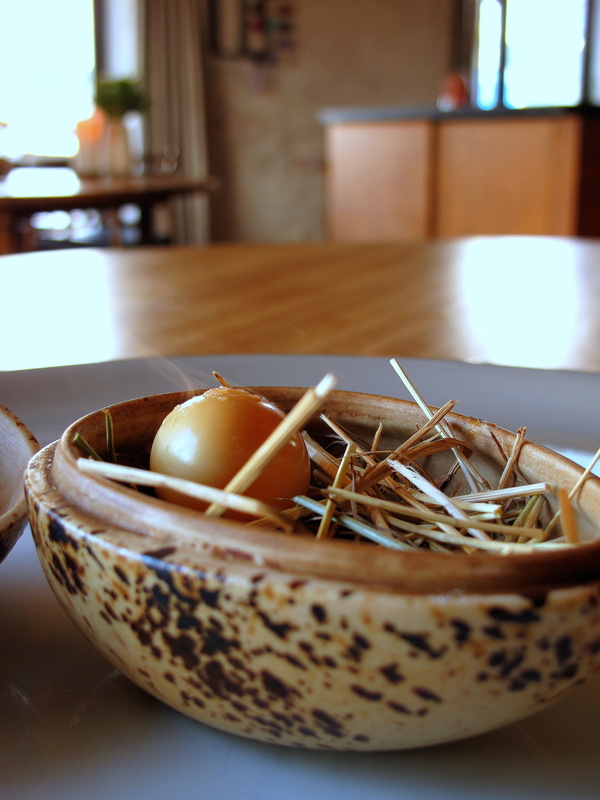 At once, an aromatic cloud of smoke sluggishly floated up and away, revealing a single, little quail’s egg nestled upon straw bedding. Eaten entire, the small, pale amber ovule, pickled in apple vinegar before smoked over apple wood, quickly burst to imbue the whole mouth with its warm, unctuous yolk whose mild smokiness was tinged with fruity tartness. 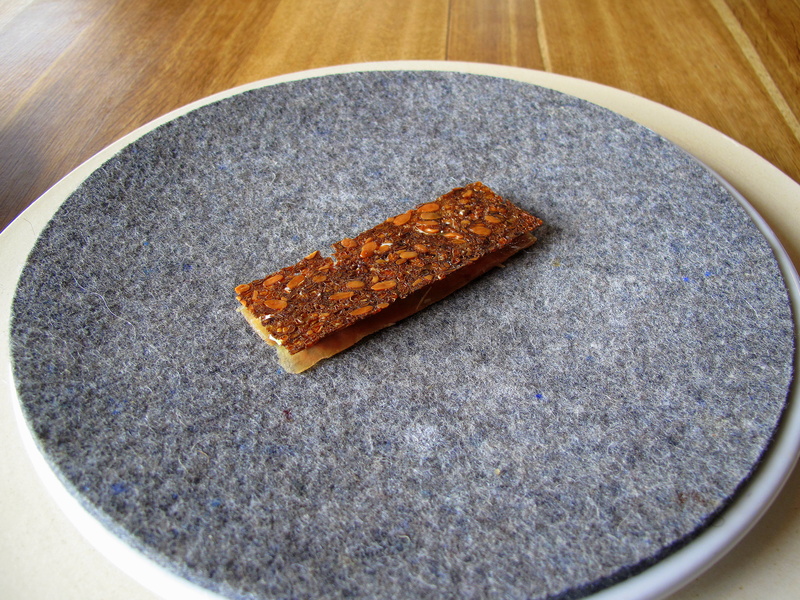 Amuse Bouche 2: Rugbrød, kyllingeskind, stenbiderrogn og rygeost. Smørrebrød, the traditional Danish open sandwich, was turned on its head, literally: the ritual rugbrød base became the topping with chicken skin the bottom and hay-smoked cheese blended with dill and lumpfish roe in betwixt the two. Once again, the appearance of this amuse was superb with the matted gold folds of skin and russet gleam of the toasted rye interrupted by bright white cheese interspersed with pinkish rose pearls of roe that mimicked the grains of the bread above it. The smoky, salty, sweet savours of the filling balanced excellently whilst its creaminess, punctuated by the poppy eggs, contrasted against the grainy, brittle rye and super-crispy skin. This last element was the highlight here – deliciously rich, it was a reminder of [my] childhood when one does not needs not think twice about devouring such wicked items like the fatty crust of a roast chicken. Although instantly familiar, like this the skin also tasted brand new. And although a little naughty, it was of course very nice. 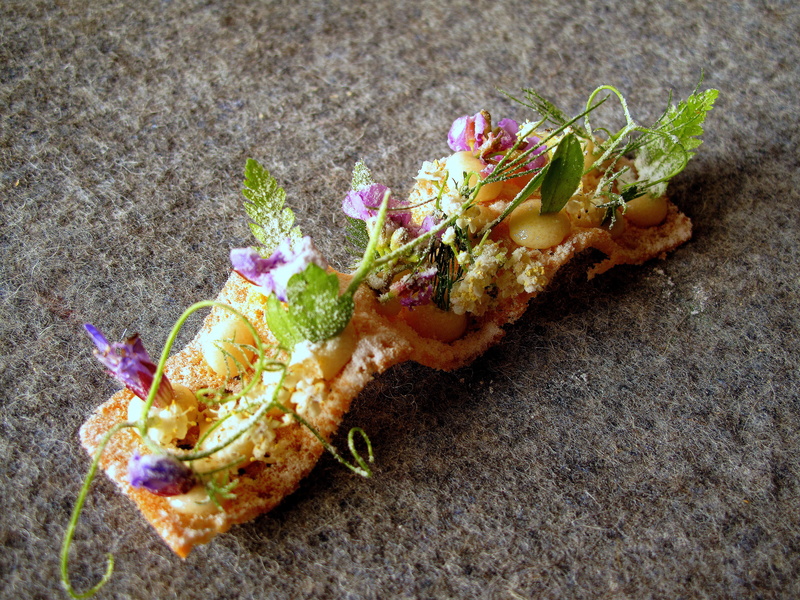 Amuse Bouche 3: Radiser, jord og urteemulsion. 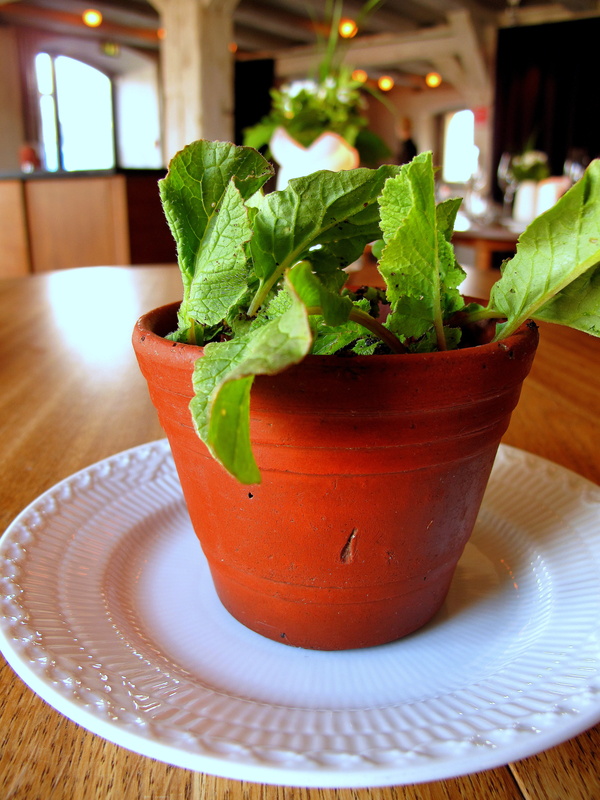 Planted upon the table, a terracotta garden pot came filled with dark soil from which sprouted large, vibrant leaves. With cutlery withheld, one is informed that everything within is edible. 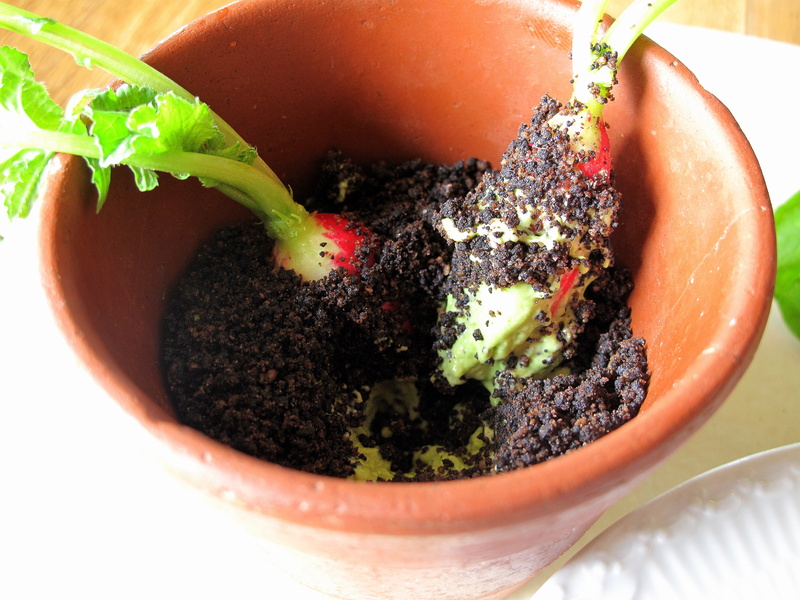 Holding onto one of the leafy tops, a radish was easily extracted, exposing, as it came out, brilliant green cream beneath the earth that still clung to the root. 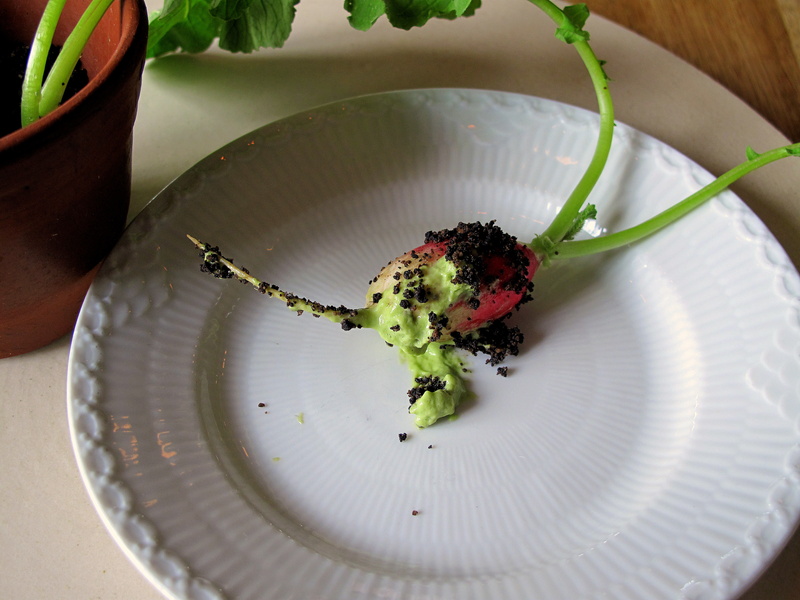 Peppery and almost sweet, these snappy radishes were from Lammefjord and belonged to Søren Wiuff. The foamy herb emulsion that they had been buried in was composed of sour sheep’s yoghurt flavoured with tarragon, chives and chervil; it was an addictive match with the crunchy malt, beer and hazelnut crumble that covered it. 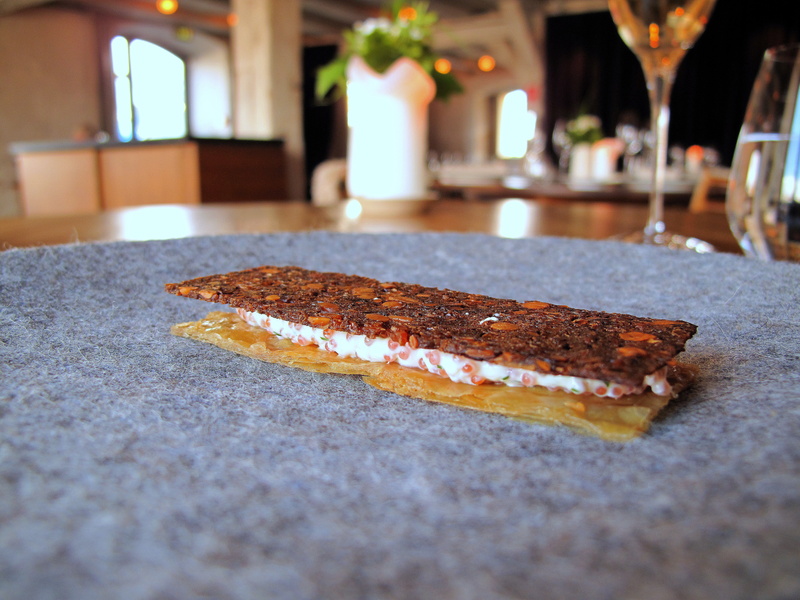 Amuse Bouche 4: Toast, vilde urter, pighvarrogn og eddike. 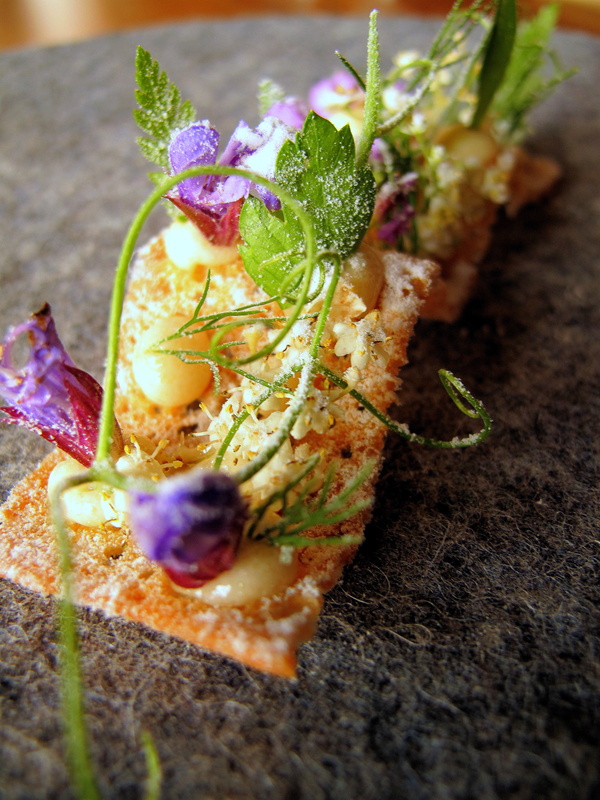 An undulating layer of crisp bread was sprinkled with vinegar powder and dotted with turbot roe cream; each of these spots was pierced with precisely placed wild herbs and their flowers. This little cracker was a lesson in contradiction: delicate and surprisingly light, the flavours it offered were surprisingly strong. The first bite of the wavy wafer unleashed a small mist of vinegar dust that filled the air about the mouth. It was also extremely tart, although not unpleasantly so, before being quickly assuaged by the faintly buttery roe – a Finnish speciality – and herbal, flowery plants that had been freshly foraged. Brødet: Spelt og Manitoba. 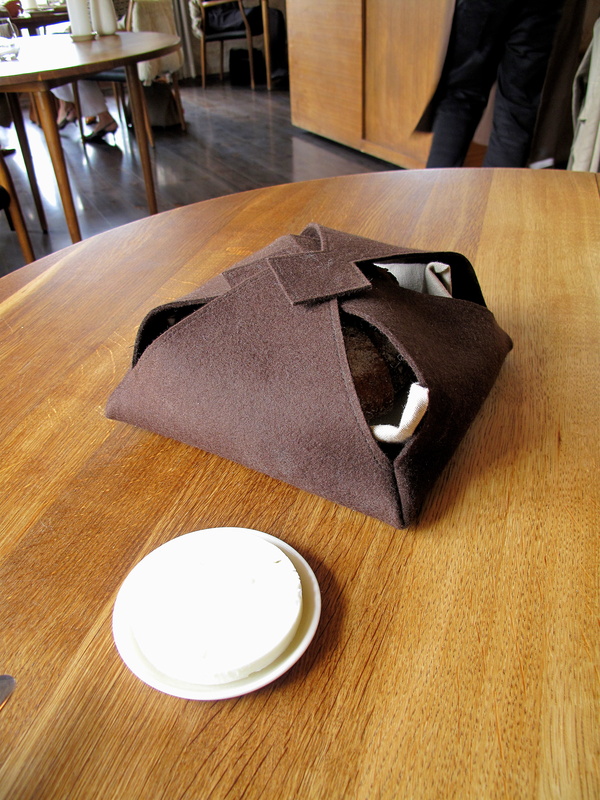 A square-shaped felt pouch was brought to the table; its leather ribbons were unravelled. Inside its cloth-lined belly sat two sorts of bread. Both were baked onsite and both were piping hot (as they remained for some time). One was Manitoba sourdough which, made with hard, highly refined wheat, was crunchy and dense. The other, spelt, had nice crust and fluffy middle. 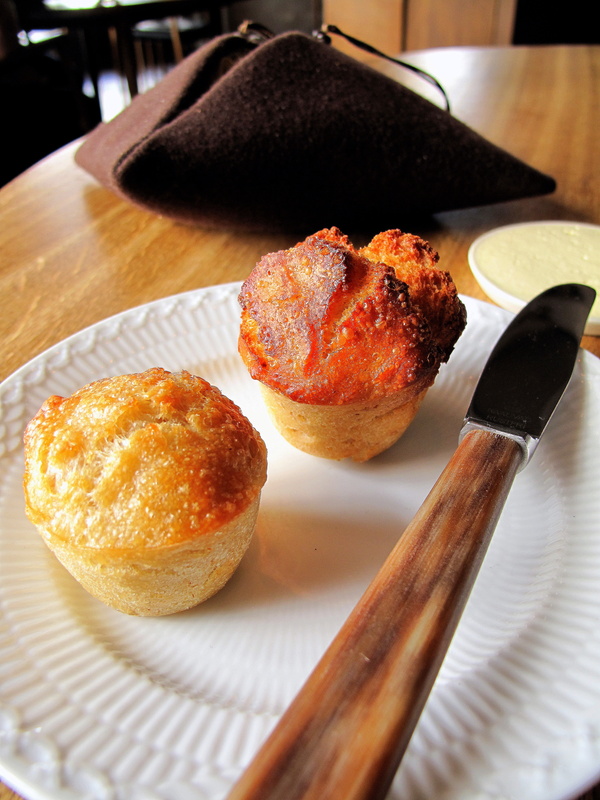 Alongside these, a platelet of organic Danish butter was served. Whipped through with skyr – a cheese from the fermented milk of Icelandic cows, a breed traceable to the time of the Vikings – this had great lightness and soft tang. Entrée 1: Blæksprutte og grønne jordbær; Fløde og dild. 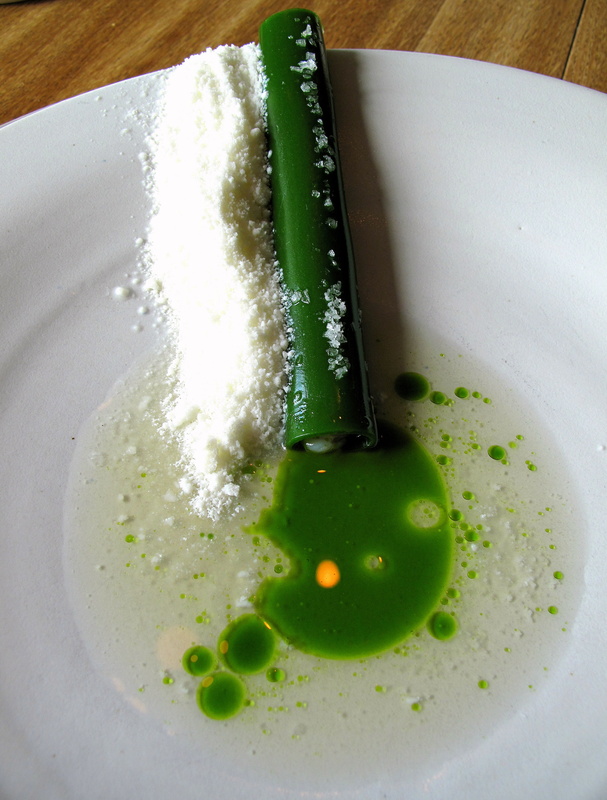 Almost translucent, ivory ingot of raw squid, deftly diced into identical, little squares, its contrary corners crowned with a couple of green strawberry slices standing upright against each other whilst a small mound of their granita rested on another, was topped with dill and toasted rye kernels; the shellfish sat in fresh cream laced with dark green dill oil. A picturesque plate already, it also suggested something of Scandinavian springtime: the rolling landscape; the green breaking through snow white; the snow itself…Furthermore, to most interesting effect, this recipe indulged the Danish love of berries and cream. Combining seafood and dairy is uncommon, but the cream worked delightfully well with the tender Danish west coast squid. The milky former enriched the latter whilst unripe strawberries added an exact acidity and the uplifting oil, subtle herbiness. Entrée 2: Rå rejer og tang; Rabarber og urter. 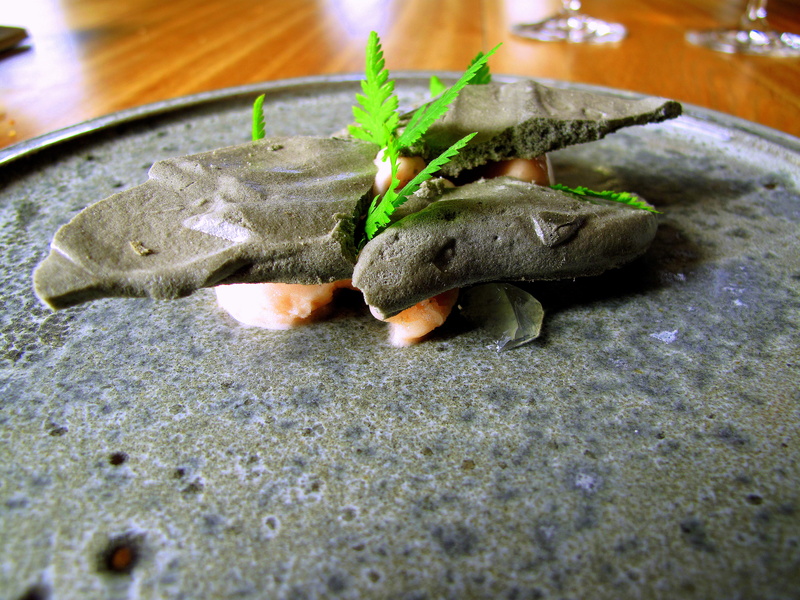 A thin, bright blanket of sea lettuce, beset with beach herbs, cubes of pickled rhubarb and drizzled with the fruit’s juice, concealed underneath small uncooked shrimp from Smögen. Considered Sweden’s finest, these delicately sweet specimens melted in the mouth, their savour countered by the springy, subtly sour rhubarb and barely bitter algae. The surprise was strandsennep or beach mustard, whose blades and blossoms, collected by the chefs from along the seashore, had definite peppery heat. Entrée 3: Tatar og skovsyre; Aromatisk enebær og estragonemulsion. 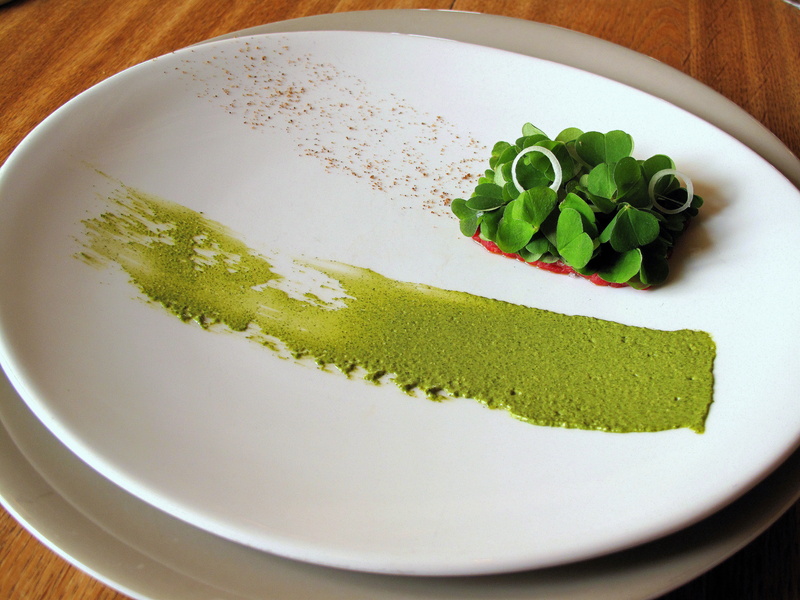 Tartar of Danish beef, arranged in a neat rectangle and besprinkled with toasted rye breadcrumbs and grated horseradish under wood sorrel and rings of onion, left a trail of ground juniper in its wake; a matching belt of vibrant tarragon emulsion shadowed the beef and its hoofprints. To be consumed without cutlery, one uses the heart-like leaves of wood sorrel to clasp the just-chopped meat, smear it through the tarragon then swab it in specks of juniper. The initial pleasure came from the presentation. 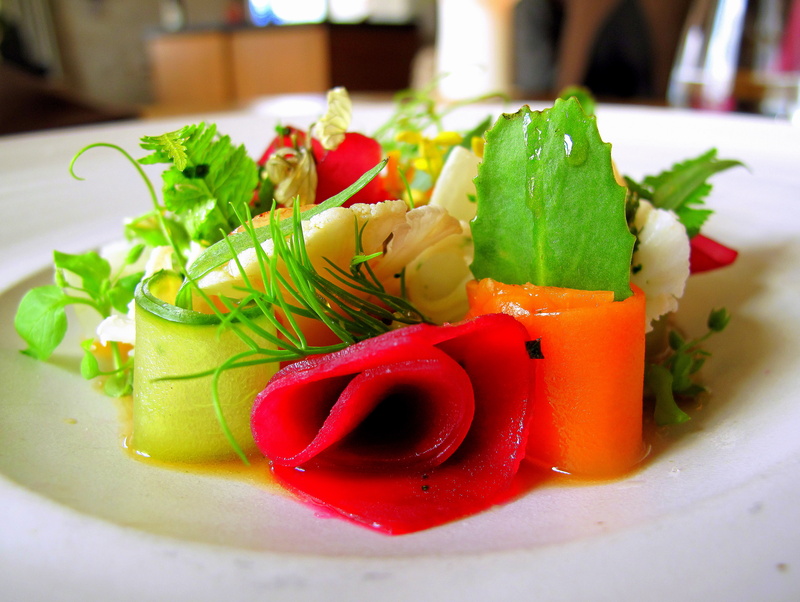 Vivid and colourful, there was also simplicity, freshness and purity on the plate. Roughly cut yet trimly set tartar; cluttered though carefully fixed sorrel; coarse, but deliberate sprinkles and daubs presented rustic precision. 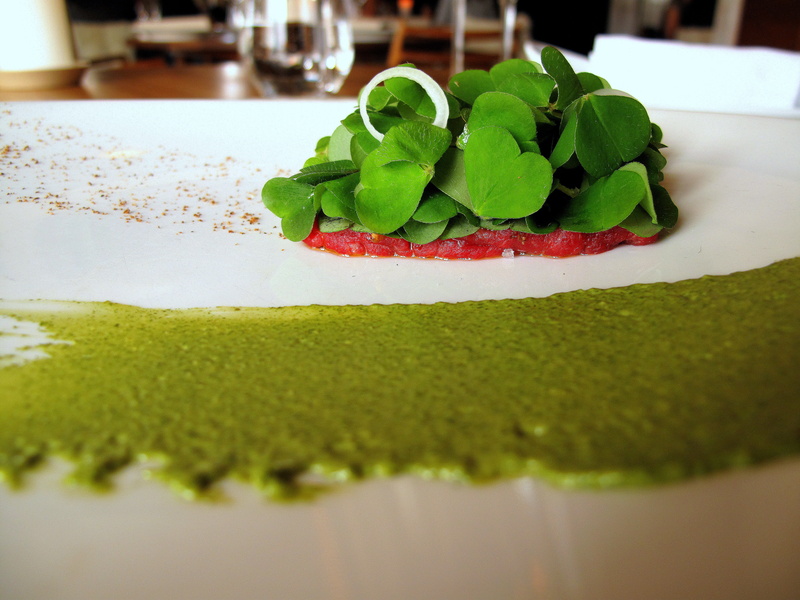 Additionally, the leaf-topped tartare over the green row immediately evoked a dynamic image of the animal itself grazing across the field. The beef, mild yet clean and flavoursome, was enlivened by the lemony spark of the sorrel, spicy horseradish and warmth of the mustard oil from Gotland. Aniseed tarragon and stimulating, woody juniper were both distinct and balanced delicately well; whilst the rye added crunch. This course considered all the senses, pleasing more than simply the palate and provoking sensations both amusing and intellectual. Eating with one’s hands makes this instantly more than just another dish. Foremost, it is fun; a challenge to social convention and expectation too. However, on a deeper level, it also connects the diner to the food – the textures manifest no longer only in the mouth-feel, but on the tips of one’s fingers; or through the lemon scent that stains their hands, for instance. Moreover, there is the romantic vision roused; one realises and appreciates that this is how our ancestors – and/or how the Vikings – long ago once ate. Raw food with bare hands. Entrée 4: Knivmusling og peberrodssne; Persille og dild. 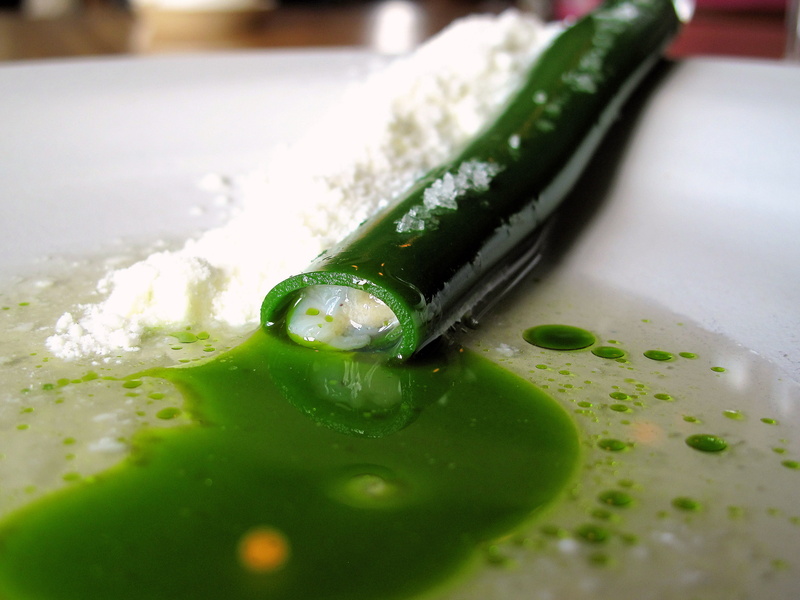 Myrtle cylinder of parsley jelly, concealing local razor clam, came laid across the bowl, leading from its centre to its cusp; a deep, loose line of horseradish snow skirted its length. 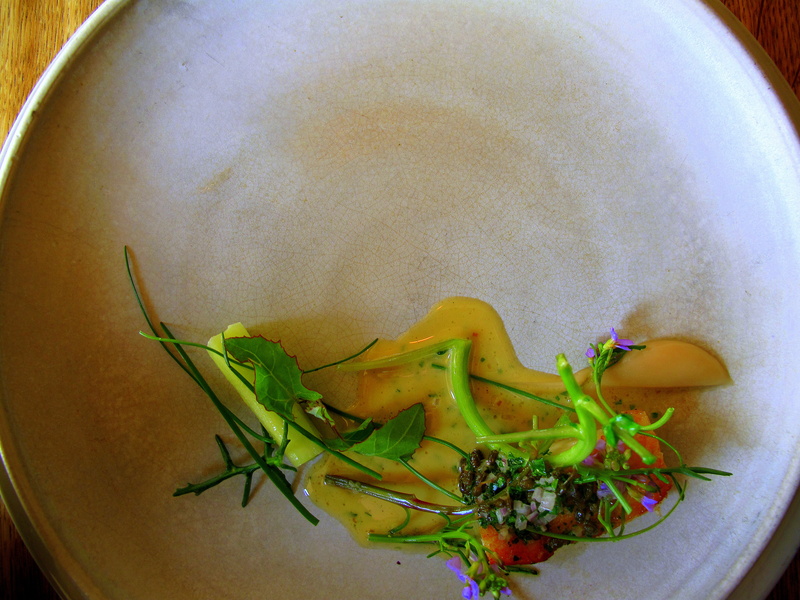 Tableside, juice from the clam, mingled with mustard-dill stock, was poured. The plating here was very interesting, in particular, the inescapable likeness to a sewage pipe – razor clams are actually an invasive species in the region, thus this suggestion of waste or undesirability could have been a nod to that fact. The tenderness and sweetness of the clam exceeded expectation whilst the parsley wrapper was pepper cool with slightly gelatinous texture. The icy blend of buttermilk and horseradish (once a common companion to raw shellfish), although cold, was unexpectedly potent with an agreeably creamy consistency. The cool effluent was intense and crisp. Entrée 5: Friskost og friskblomster; Brøndkarse. Over a bed of fresh cheese, a richly-coloured array of just-picked flowers, interspersed with croutons, was showered; a sauce of watercress and parsley lay in attractive swirls to one side. 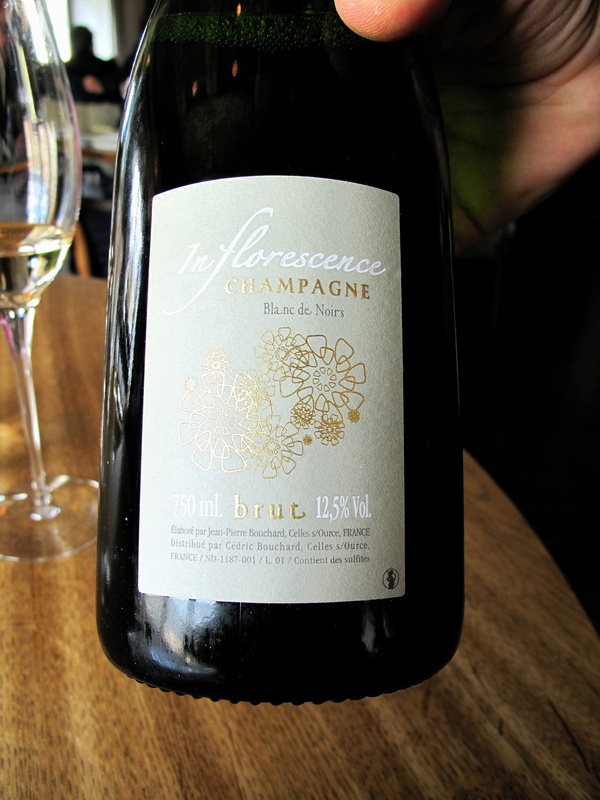 Both the cheese had been made and the wild blossoms gathered by the chefs themselves that same day. The ethereal, buttermilk-based cheese worked well to showcase the springy assortment of rocket, parsley, nasturtium, mustard and more florae. The watercress, at first dulcet, become stronger and spicier as its savour lingered while the parsley proffered a grassier note. Entrée 6: Jomfruhummer og söl; Persille og havvand. A warm basalt stone, plucked from a Gotland potato field, was presented. A single, surprisingly sizeable langoustine from Læsø lay on it. Randomly placed, bright green beads about the rock were composed of oyster and parsley emulsion and crowned with rye crumbs; grated Icelandic dulse – söl – left sandy magenta streaks across the surface. 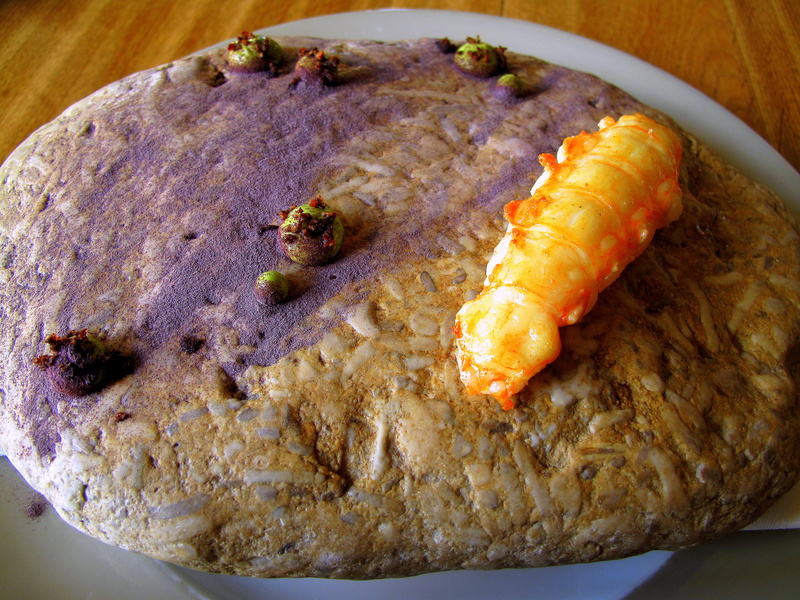 It was as if the sea had washed up its most prized prawn upon a stone on the seashore; the roasted seaweed dust and barnacle-like outgrowths redolent of the sea itself aided and abetted the analogy. Once again one uses their hands to enjoy the shellfish, which barely cooked, was scrumptious; luscious, fat and so sweet. It was even possible to feel the tiny, tense fibres that encircled the plump body snap as the meat was bitten into. The mineral emulsion and briny söl became almost afterthoughts. Entrée 7: Asparges og skovmærke; Humle og dunhammer. 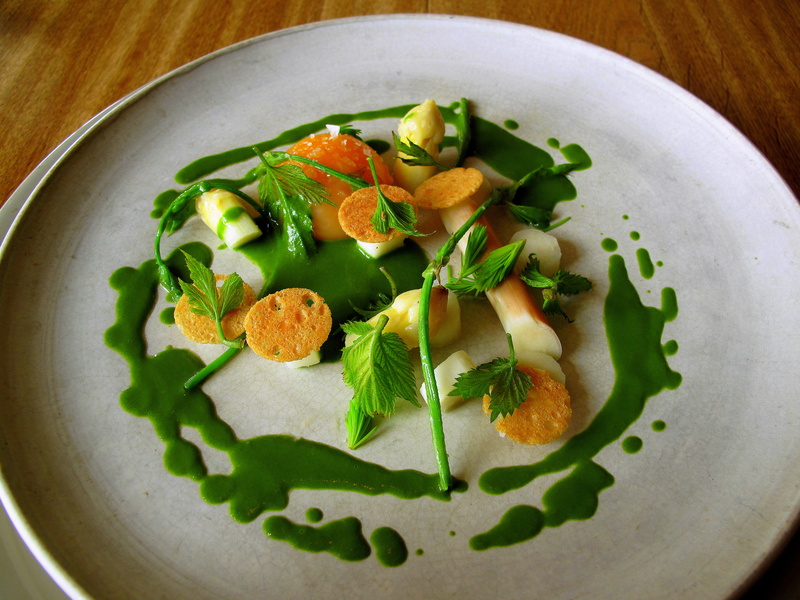 Søren’s white asparagus, chopped to varying lengths then set laid or standing, surrounded sous vide wild duck egg; over all these, fiddlehead ferns, hops and bulrush were strewn and rough rings of woodruff sauce were drizzled. The Lammefjord greens again amazed with the al dente asparagus juicy and tasty, its flavour accentuated by the woodruff and bulrush, to give the dish a surprisingly sweet nature. However, the richness of the unctuous egg had taming effect and proved an excellent balance as did the crisp and subtly bitter hop shoots. Additionally, bulrush and fiddlehead fern – here found as fronds that had been diligently detached from the unfurled, scroll-like head – both share an innate affinity with asparagus which reinforced the vegetable’s distinct essence. Entrée 8: Aske og porrer; Blåmuslinger og kongekrabbe. Alternating cylindrical couples of jet black and scarlet-swathed white occupied the centre of the plate. Frothy mussel emulsion was spooned out, almost completely covering these, before golden toasted breadcrumbs were shaken overtop. 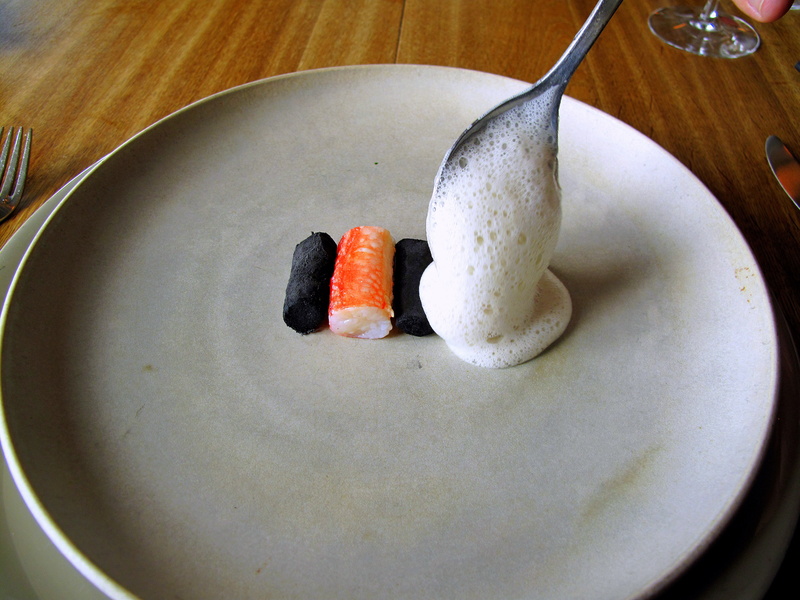 The two tubes were in fact leek stems rolled in hay ash and poached Norwegian king crab thigh-meat. The latter, so succulent with lovely brininess, seemed almost liquid-filled, whilst the former were startlingly delicious. Using ash as a spice is an ancient Nordic tradition mainly applied to herring and it imparted a complex, intense caustic savour like edible smoky soot; the dark coating then quickly dissolved on the tongue, releasing the leek’s mellow flavour. This was a totally new taste sensation. The mussel sauce was strong and acted as salty seasoning whilst the brittle breadcrumbs bestowed crunch. Plat Principal 1: Pighvar og vegetabilsk stilke; Syltede hyldeblomst. Tranche of roasted North Sea turbot, its skin appetising dark amber and laden with unripe elderberry, caper and shallot garni, was teamed with stems of watercress and leek, all scattered with sprigs of strandtrehage and strandsennep; celeriac purée and a thin sauce made from capers completed the recipe. The turbot’s breeding season lasts from April to August, during which time, the fish stores more fat in preparation for procreation. A side-effect of this it that its meat is even more mouth-watering than normal and this specimen was indeed rich and toothsome with some of that elusive, excellent melting fattiness to it. The berry and caper garnish brought a pleasingly acidic burst whilst the crackly, moist stems had contrary sweet touch. Beach herbs, with their latent heat and citrus, were also welcomed. Plat Principal 2: Råstegt hummer og salat root; hybenrose og ribs vin. Sautéed Danish blue lobster, blanketed with red currant wine and sat atop lobster jus, was buried amidst roots of salad, shoots of wild beach pea, their little purple flowers and rosehip petals; a streak of lobster coral accompanied. The dish, decorated with different shades of splendid red and lush green, was simply beautiful – and it tasted just as good too. 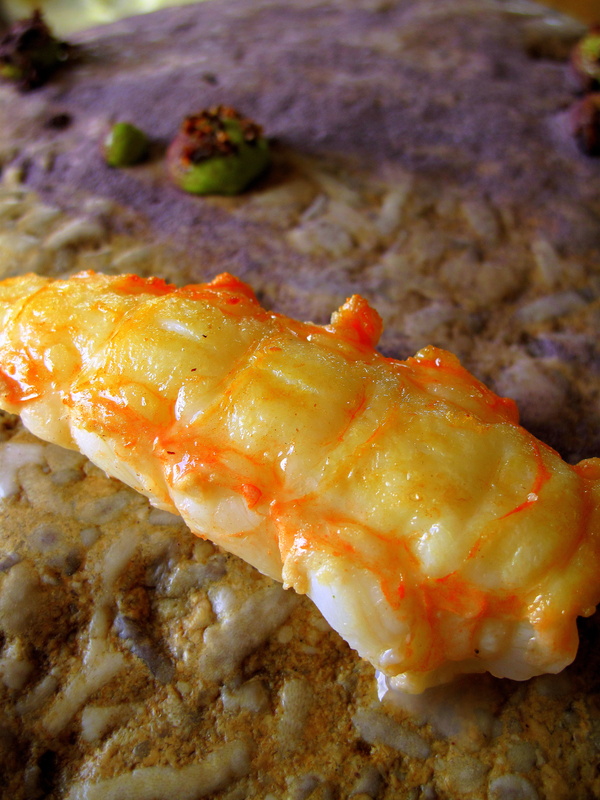 The lissom lobster, very nicely-timed, had juicy, supple flesh and was full of natural sweetness. The tangy rosehip, reinforced by the nearly sugary beach pea, was an splendid bridge between the lovely shellfish and fruity-tart red currant wine. The coral was concentrated and the lettuce, succulent and snappy. Entremet 1: Læsøløg; Løgkarse og ramsløg. 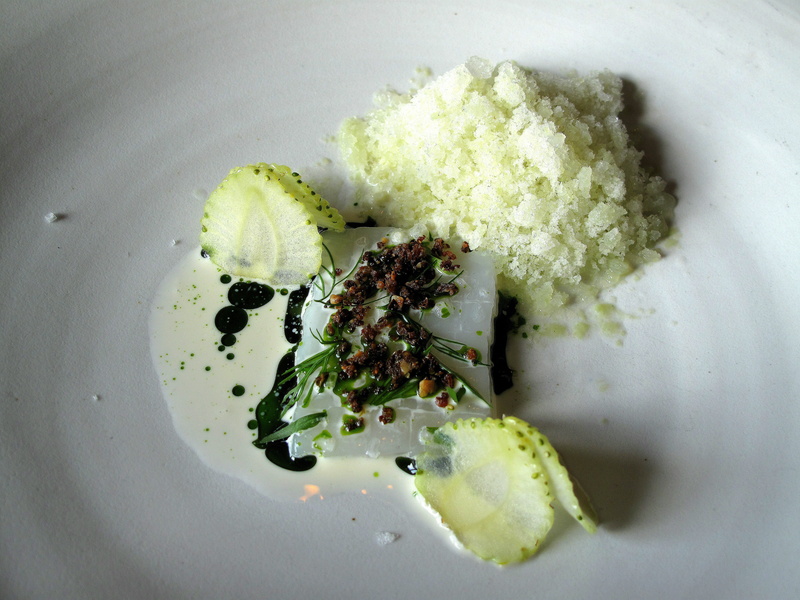 Læsø’s renown is not limited to its langoustines; this time, its onions took centre-stage. Onion compote, carpeted over with prast ost and encircled with onion slices – half of which were soaked in beer, the other half pickled – was peppered with chive flowers, chickweed, ramson stalks and onion cress; tableside, onion bouillon with thyme and tapioca was served. This preparation was both an ode to onions and its relations whilst the beer-cheese-onion combination insinuated classic pub snack (cheese and onion crisps with a pint of beer). The compote had relish; its savoury, slightly strong skin of a Swedish mature cheese skin akin to cheddar, a natural companion; whilst the warm, pungent, pearly bouillon was fairly intense and gently melted the prast ost, becoming syrupy as it did so. Ramson and chive contributed hints of garlic and the two sets of onion were both crisp, with one rather malty and the other salty-sharp. Entremet 2: Marv og syltede grøntsager; Krydderurter og bouillon. Crudités of various vegetables, pickled in six varieties of vinegar, were arranged in curls and bouquets studded and bestrewn with such herbs as mustard, rocket, leek flowers and pea shoots as well as small rounds of poached bone marrow, all mizzled with a little oxtail stock. 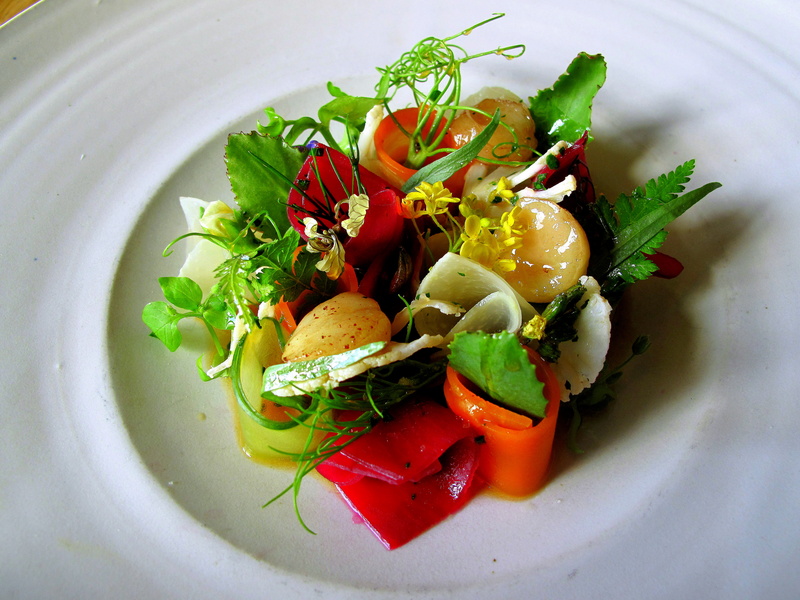 Although amounting to only a small cluster upon the plate, this course abounded with colour, vivacity and curiosity. Each bite was fresh, crunchy and subtly tart, but each was different too thanks to the mixture of marinades. The vibrant clutch, dense and solid, also invited one to delve in and thus dig up peppery blossoms or anise leaves that they had not yet already discovered. Shimmering, soft slices of marrow also hiding amongst these tendered some richness whilst the bouillon beneath was deep and delectable. There was a deft balance between sweet and sour here, which also worked to cleanse the palate after the previous onions. 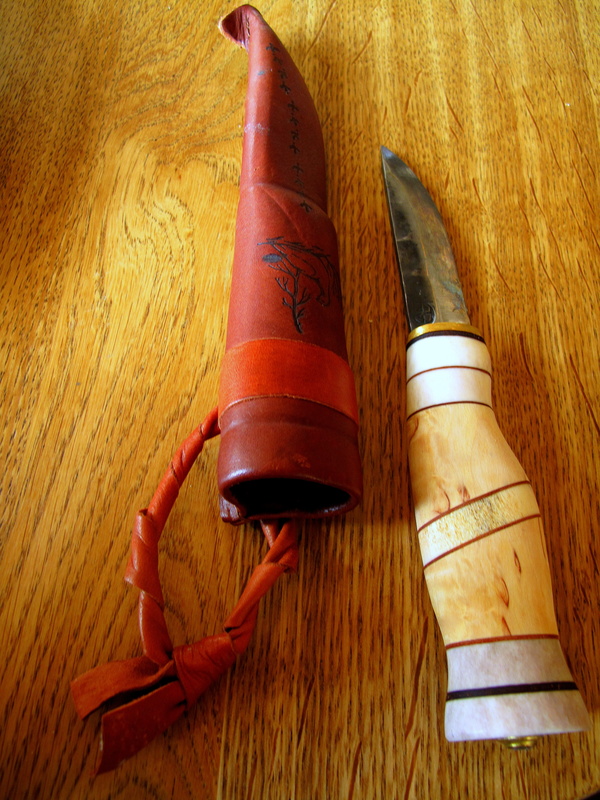 A leather-bound, reindeer horn-handled puukko knife, handmade in Lapland, was placed upon the table. Rustic yet carefully crafted, even the noma knife has become somewhat iconic. Plat Principal 3: Moskusokse og mælkeskind; Spæde hvidløg og ramsløg. 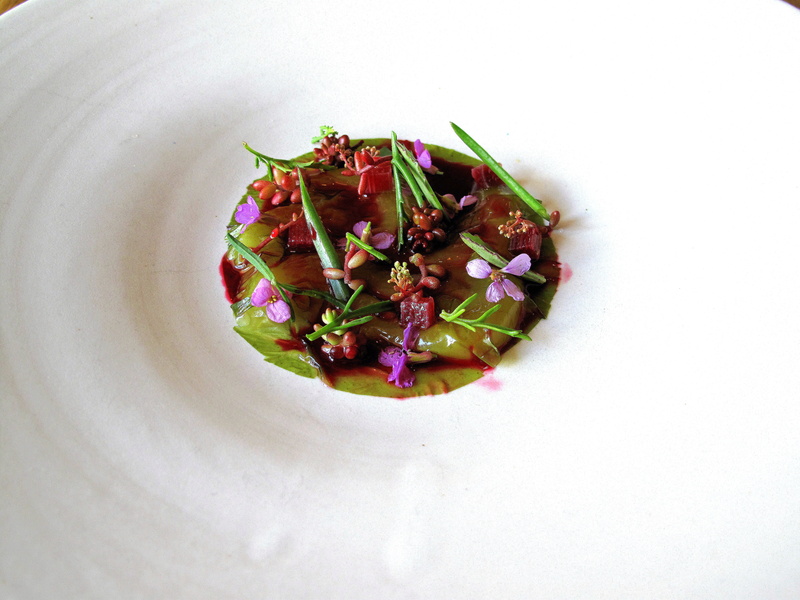 From Greenland’s west coast, a mahogany haunch of musk ox, resting in gamboge jus suffused with ramson, was teamed with alabaster folds of milk skin and grilled baby garlic and cucumber whilst dressed with capers and mini, mauve garlic flowers. The meaty fillet was well-marbled, tender and flavoursome. Its sticky, concentrated sauce was delightful, the ramson linking nicely with the young garlic. The milky skin, literally the skimmed off coating that forms on the surface when cooking milk, was reminiscent of yuba and slightly tart-sweet; this was interesting both texturally and taste wise. Dessert 1: Birkesaft og birkesirup; Sødskærm og honning. 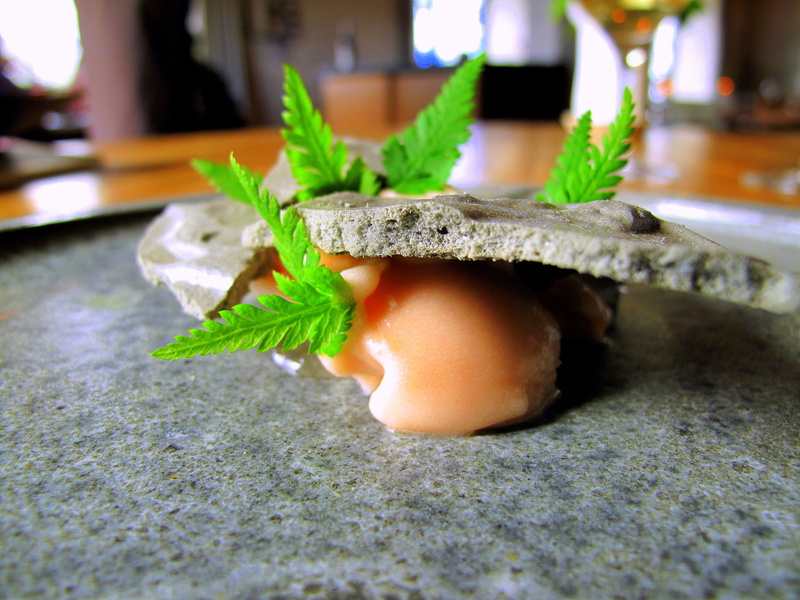 Broken birch slates of meringue, overlaying birch sorbet and jelly made from mead and honey, were embedded with bright, baby sprigs of Spanish chervil. This was instantly resonant: the coarse-cut meringues, matching the gray plate, impersonated the stony earth; the sorbet resembled the sap and roots; whilst the herbs were little saplings breaking through and growing forth. The sorbet was mildly sugary and clean; jelly of mellifluous wine and honey collected from a beehive only a few miles away, was stronger; whilst the Spanish chervil like liquorice. The meringues, made using the water in which birch bark had been bathed, were excellent – light, grainy and not at all cloying. 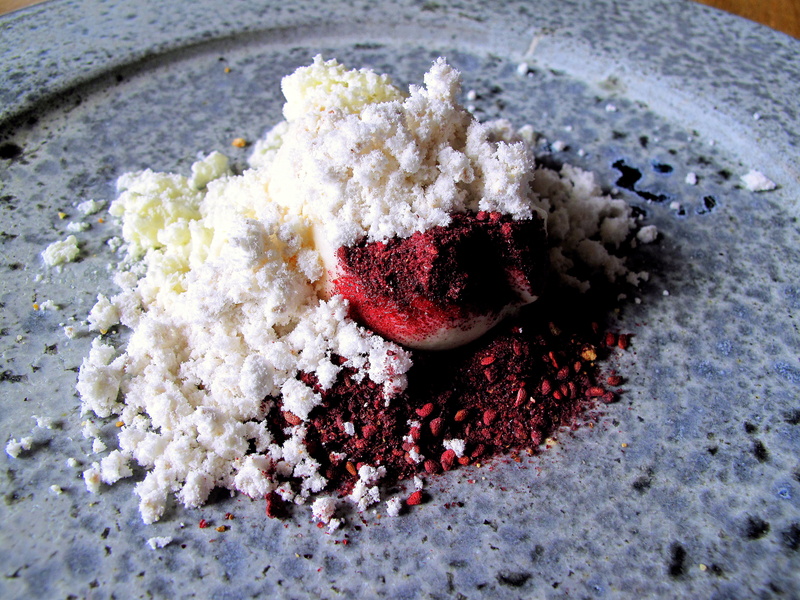 Dessert 2: Rødbede og skovsyre; Creme fraiche og syltet hybenrose. A circle sat in the dish’s centre, split into two halves. 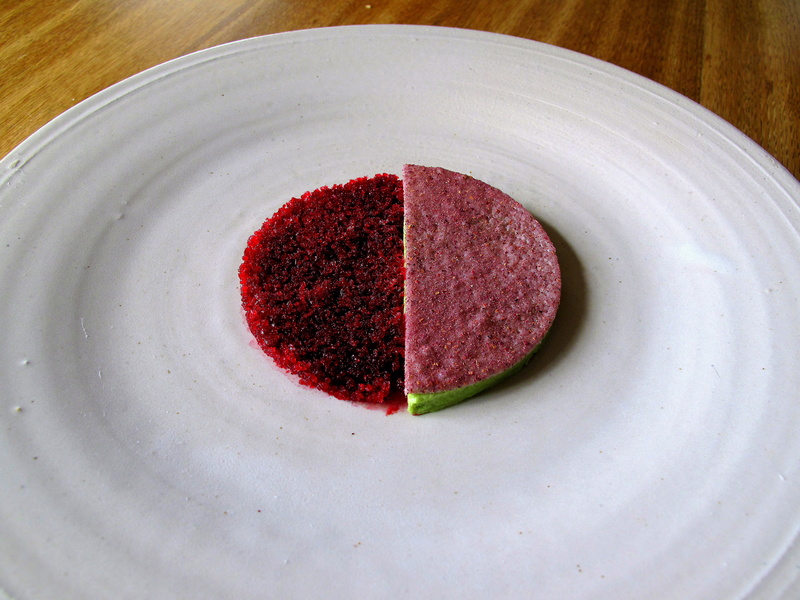 On one side, there were compact maroon crystals of beet and pickled hip rose granité; on the other, pastel green sorrel mousse was crowned with pale hip rose tuile topped with the grated fruit. 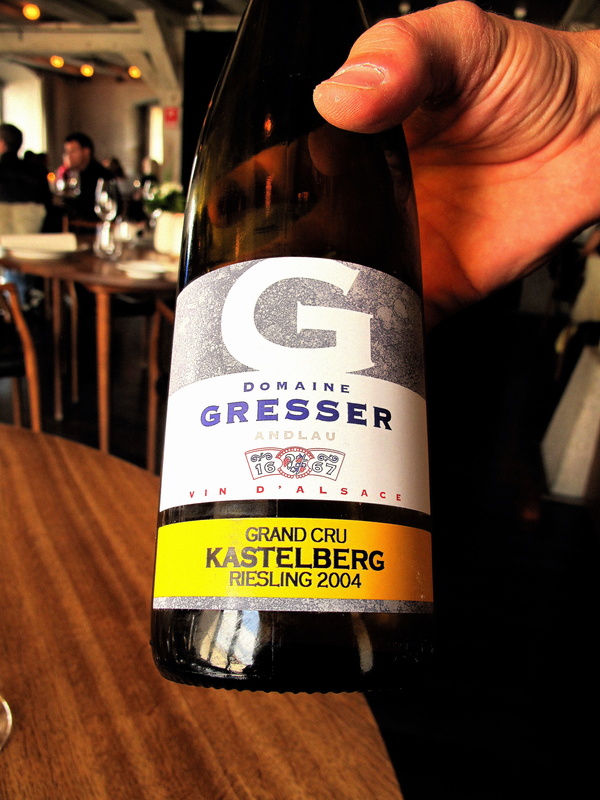 Crispy, crunchy and smooth; sweet, sharp and earthy – this was more complex than its simple appearance suggested. The subtle savours were also very well poised. Dessert 3: Valnødde pulver og is; Tørret fløde og tørrede bær. 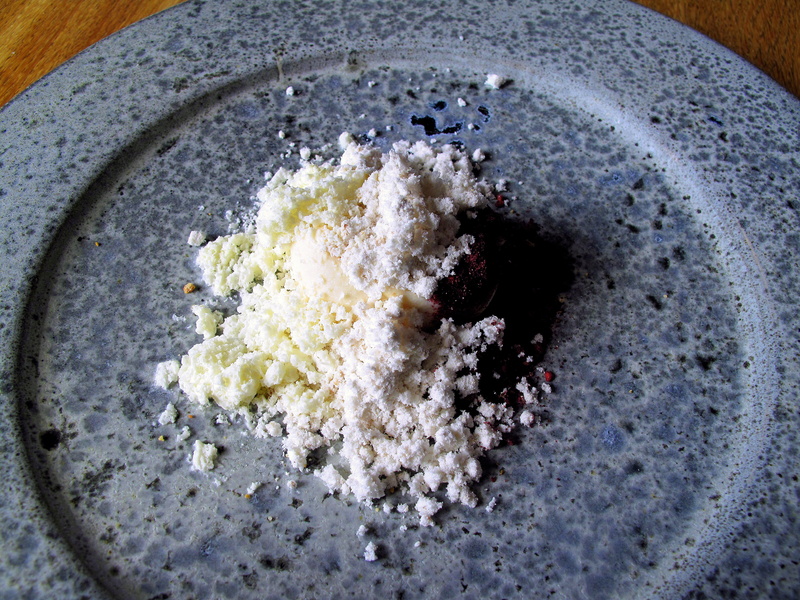 Walnut ice cream came covered in three crude strips of cream powder, walnut dust and dried blackberries. This was another dessert that seemed more straightforward than it really was. Tasting the three toppings together proved extremely astringent, quickly absorbing away all the moisture from the mouth and leaving just fruity-sour essence before the soft, moussy walnut ice cream quickly supplied gentle succour. 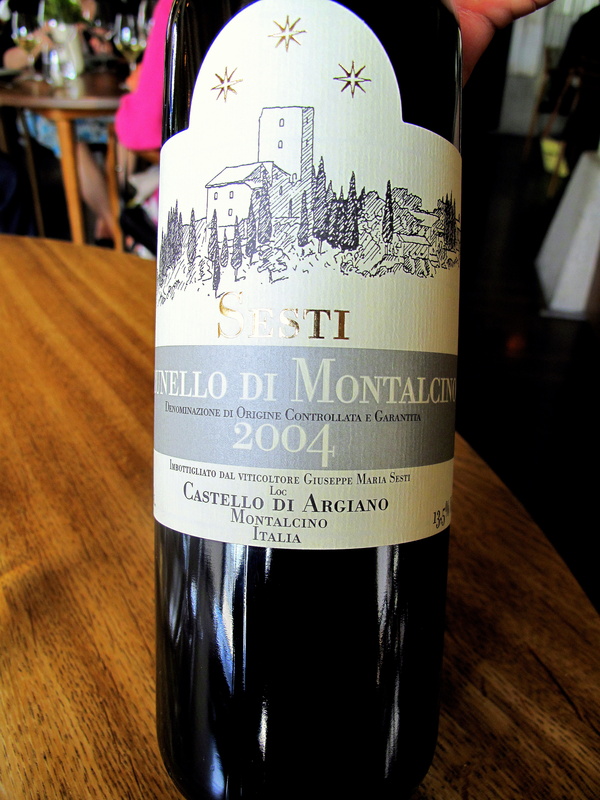 Building on the natural relation between walnuts and blackberries, this worked to delicious effect. 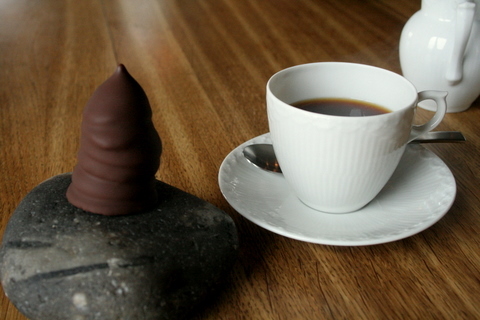 Petit Fours: Flødebolle med rødbedeskum. Chocolate covered marshmallow treats can be found across Europe in varying national guises, but their widely acknowledged origin is Denmark (and it remains the largest producer of these today – apparently, the average Dane eats fifty a year). Petit fours entailed this traditional dainty, with a twist. 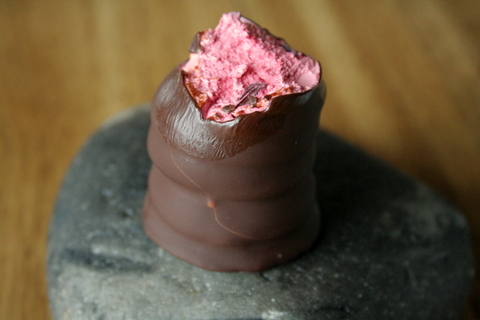 Served on a cold stone (for the flødebolle began to melt as soon as it was touched), thin, fine quality chocolate case and malt cracker base bordered fluffy, mild and yummy, pink beetroot mousse. I have been very lucky in my dining life so far – not only have I rarely been on the receiving end of substandard service, but I have been subjected to some of the kindest imaginable. Bearing that in mind, the treatment on offer here is some of the very finest that I have seen. I really was impressed by the quality of care and genuine consideration conveyed by all those at noma. 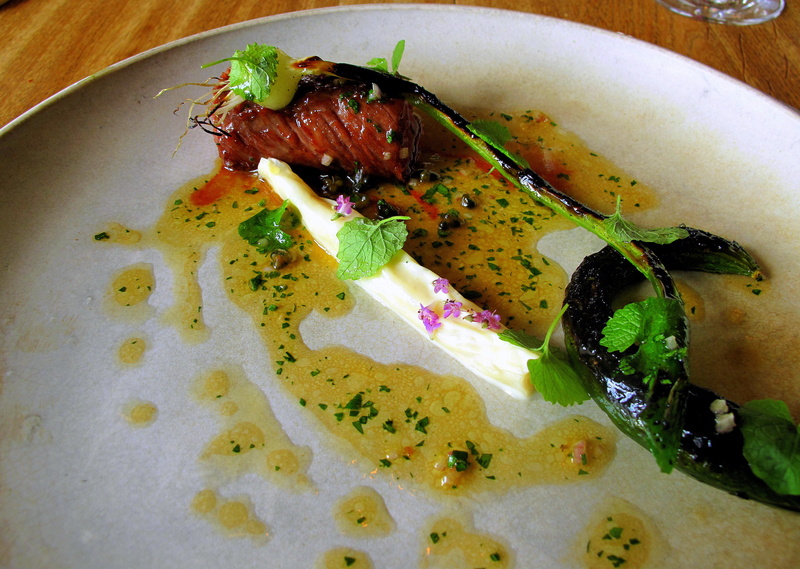 Interestingly, Redzepi encourages his chefs to serve and explain many of the dishes themselves. Not only is this a pleasantly unexpected twist, but it also undeniably adds another layer of openness and intimacy to the restaurant experience. Additionally, given that many in the kitchen are actually British – ‘they are battle-hardened. They are good, strong. Ready for anything,’ Redzepi says – speaking with them was interesting and entertaining. It was fascinating to watch the front-of-house staff at work. One would expect the introduction of chefs into the dining room to complicate, possibly even disrupt them. But not so. Instead, it was continuously calm and co-ordinated with servers gracefully and confidently wending their way between tables and chairs. They were always relaxed and always made time for the guest. I conversed with many over the course of the meal and all were very affable, engaging and thoughtful – having spoken to Kim, Ulf and Laura most, I single them out especially. Together, they are led by Lau – simply the consummate maître d’hôtel – who is earnestness, charm and niceness personified. Everyone seemed to really enjoy what they were doing and it showed in the little details. For instance, it was a delight to note that not only did the staff smile at diners, but they smiled at each other too. There is a warmth and avidity shared by all – and it is contagious. Over lunch I was also able to meet and talk a little with René Redzepi. His boyish mien and unassuming nature automatically engendered rapport and admiration. The more we spoke, the more I was overwhelmed by his generous and good spirit. Clearly impassioned and clearly relishing his work, I was certainly stirred by his enthusiasm. The meal itself was just stunning. The amuses were arguably the most engaging I have ever been served – satisfying taste, intellect and emotion individually and collectively. From the courses that followed, it is difficult to select either my favourites or those I liked least. If pushed, I would pick rå rejer og tang; rabarber og urter and friskost og friskblomster; brøndkarse as two that were less memorable than the rest, but again, these were only relatively weaker courses rather than flawed or weak in themselves. Those that I found the most appetising included blæksprutte og grønne jordbær, the classic tatar og skovsyre, asparges og skovmærke (the best asparagus-egg dish I have ever eaten), aske og porrer, råstegt hummer og salat root and from the excellent desserts, valnødde pulver og is. The first four offerings from the kitchen were delicious and revealing. 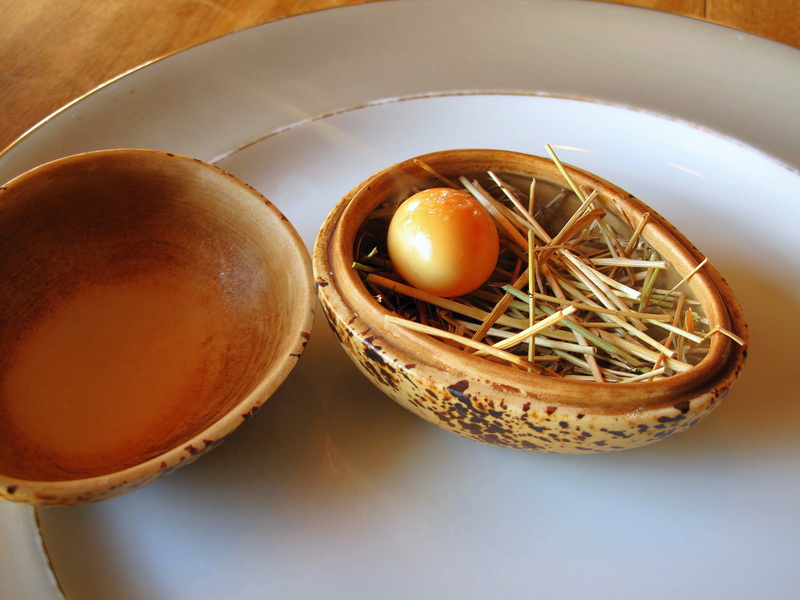 Starting with the vagtelæg, presented in its Matryoshka-esque ceramic casket that played the shell to the already peeled quail egg, so much was shown with a single, bite-size morsel. Simple yet intelligent and delectable, there was also an element of intrigue, mystery and maybe even magic from the swirling, steaming smoke which, whilst adding animation, almost convinces the diner that the egg is still cooking. Furthermore, essentially Nordic – these eggs are regularly consumed here; pickling and smoking are both basic Scandinavian preparation methods; and apples, staples of the diet – this was a fitting opener. The second course was nostalgic, indulgent and my favourite. Once again, working with (stereo)typically regional ingredients, this was a witty reinvention of something common and customary. Different characteristics of the cooking became evident with the next treat, radiser, jord og urteemulsion. Here, the highest quality raw materials were showcased in amusing, whimsical fashion. 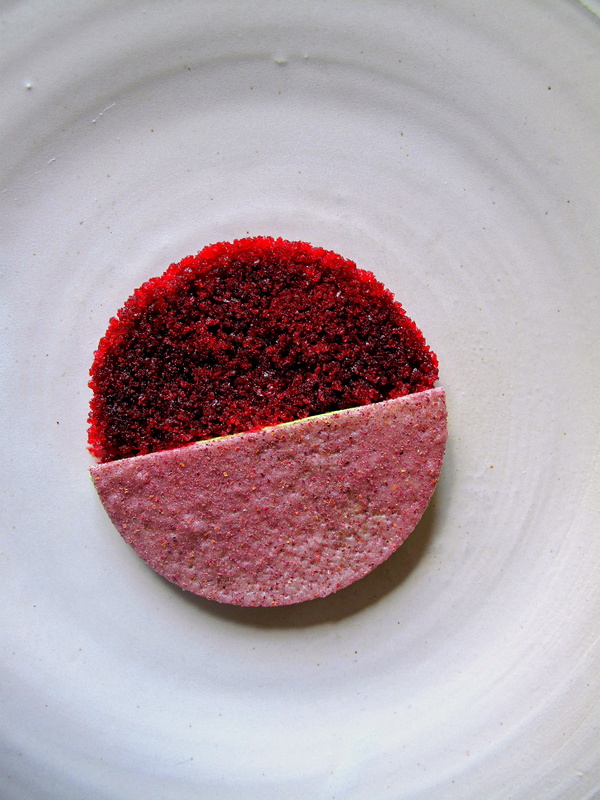 The presentation, original, clever but mostly convincing, created a sense of adventure and implied a return to nature; the playfulness patent here may have been nurtured whilst Redzepi worked under his most influential mentor, Adrià. In addition, as it so happens, this particular recipe has also been inspirational to other talented chefs, such as David Kinch and Heston Blumenthal. Amuses ended on a delicate note with another item just as reminiscent of the outdoors – a curvy cracker carrying what seemed frost-kissed wild herbs, but which were actually dusted in malty vinegar. The tatar og skovsyre: aromatisk enebær og estragonemulsion has become somewhat of a noma signature. It is understandable why. 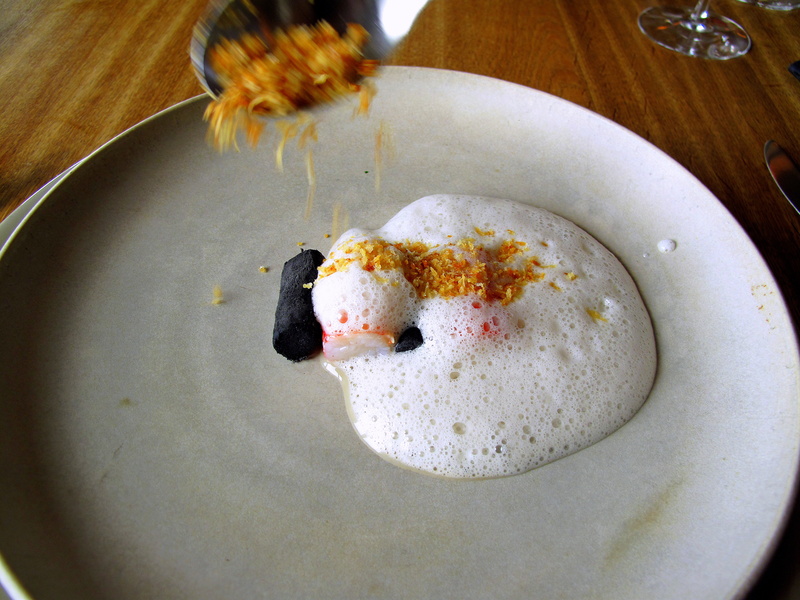 As Redzepi tells it, ‘when [we] first opened, this dish almost seemed a provocation. 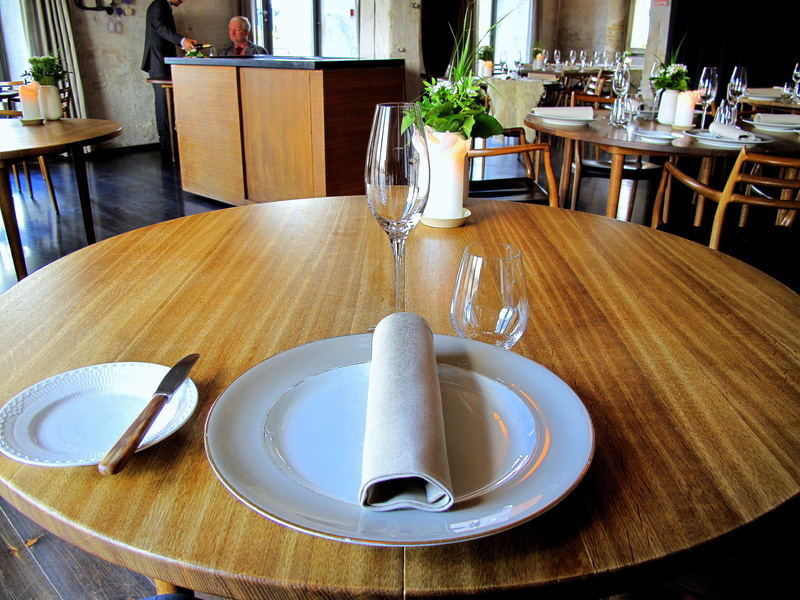 The Copenhagen restaurant scene really was dominated by these old, fussy French places. 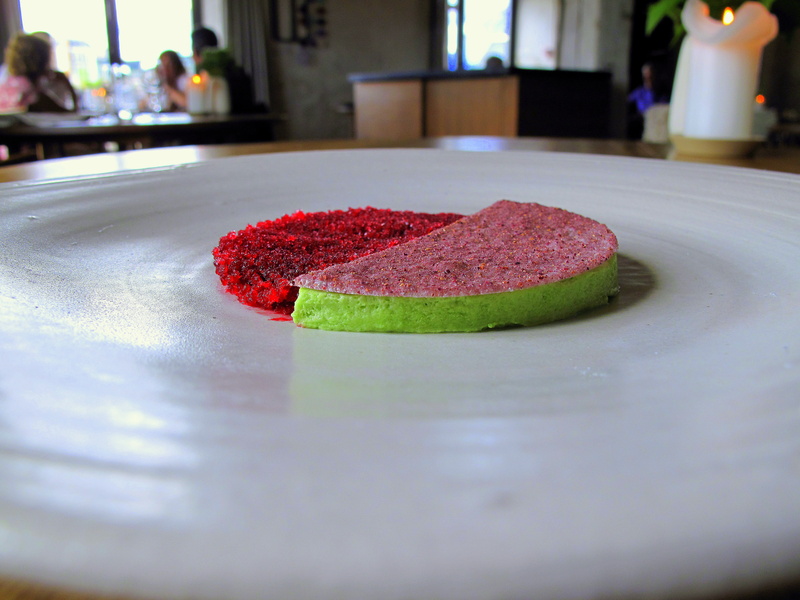 And then along comes this restaurant where they want you to eat raw beef with your hands like you’re some Viking.’ The effect of this course is two-fold – it relaxes those unaccustomed to fine dining, whilst teasing amusing those that are. And it does this brilliantly: one really cannot help but laugh whilst feeding themselves finger-fuls of tartar. The dramatic aesthetic, gamesome expression and sensory satisfaction have all already been alluded to earlier, but there is also an inescapable awareness that one is eating something distinctly Nordic. The locally-sourced ingredients, all of ancient regional relevance – juniper and tarragon being both especially bonded to the territory – served naturally with minor manipulation, suggest a specific place as well as a specific time. This was a rare transcendental dish. The issue of aesthetic previously touched upon is of special importance. Whether from the rich colours, the minimalist arrangement of elements evocative with imagery and meaning or the eloquent use of empty space on the plate, there is something almost austere here – a noble austerity – that encapsulates the severity, but also the purity of the Nordic terroir. It is as if Redzepi, having tamed the savage, but strikingly beautiful North, has distilled it into his dishes. 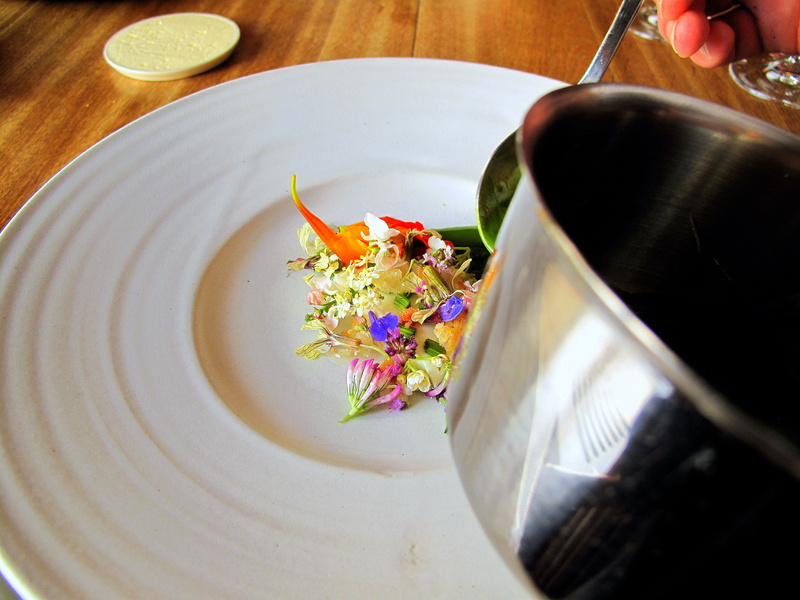 Noma is inevitably exciting as it affords one the opportunity to discover unique ingredients such as strandtrehage, strandsennep and musk ox; and taste uncommon techniques like pickling, smoking and spicing with ash. 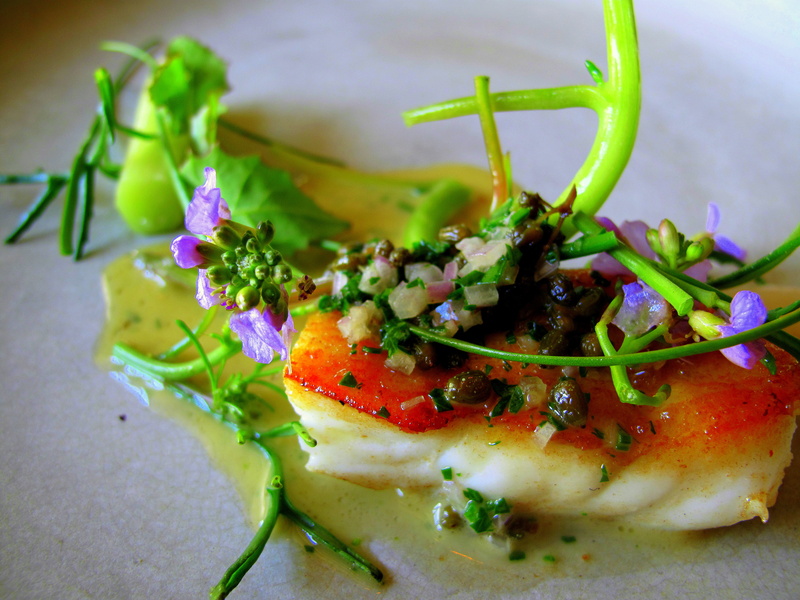 It is an introduction to Nordic cuisine – a new cuisine to many. However, beyond the novelty, there is a fundamental superiority in the creativity and cooking. Not a single misstep in execution was manifest today with thoughtful dishes, cleverly designed and delivered with deliberate care. But the adventure here does not end with trying new products or methods – one hallmark of noma’s cuisine is that each course is in itself an exploration. 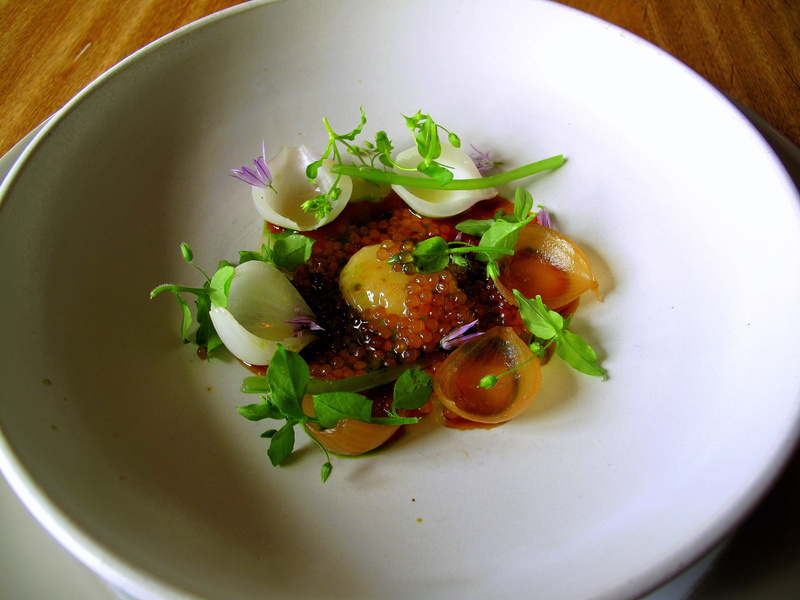 As one eats, they uncover different, dynamic and fresh flavours and textures. This is just one trait that characterises Redzepi’s distinctive cooking, though; to gain a good understanding of the others, one need only read that Manifesto he helped author. Some additional qualities that stood out from my lunch were the light saucing of plates, preference for raw foods, precise use of acidity and willingness to mingle modern and ancient cookery. Butter, cream, stocks and wine, standard in most sauces, were shunned in favour of beers, ales, fruit juices and homemade vinegars. The latter have become essential tools, also applied as seasoning (limiting the use of salt) and to produce that sweet and sour profile that is so very Nordic. Elderberries, unripe strawberries, capers and such are included to offer uplifting and bright acidic notes whilst the prevalence of raw ingredients only aids the natural and feral sense of style. 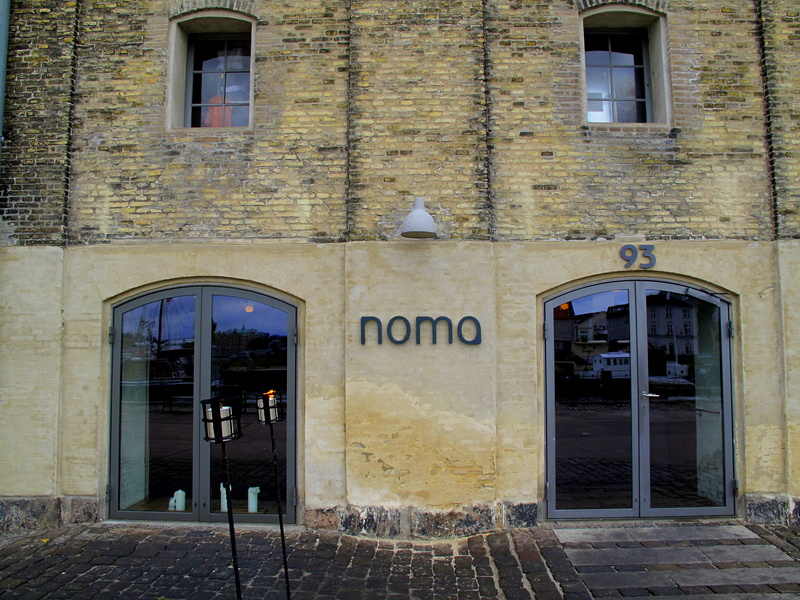 Noma was not always a success; René Redzepi and his partners’ ambitions to create a restaurant solely focused on Nordic cuisine were at first ridiculed whilst the business model proved difficult to implement with sourcing from across the Northern Atlantic much more challenging than expected. In spite of everything though, they persevered, remained resolute in their aims and maintained a strict obedience to them whilst personally scouting out new produce and establishing stable supply lines across the region. Today, few would question how far they have come or what they have achieved. Possibly forged during those times of struggle, there is a sense of purpose so strong and dedication to it so certain that it suffuses all that noma is. 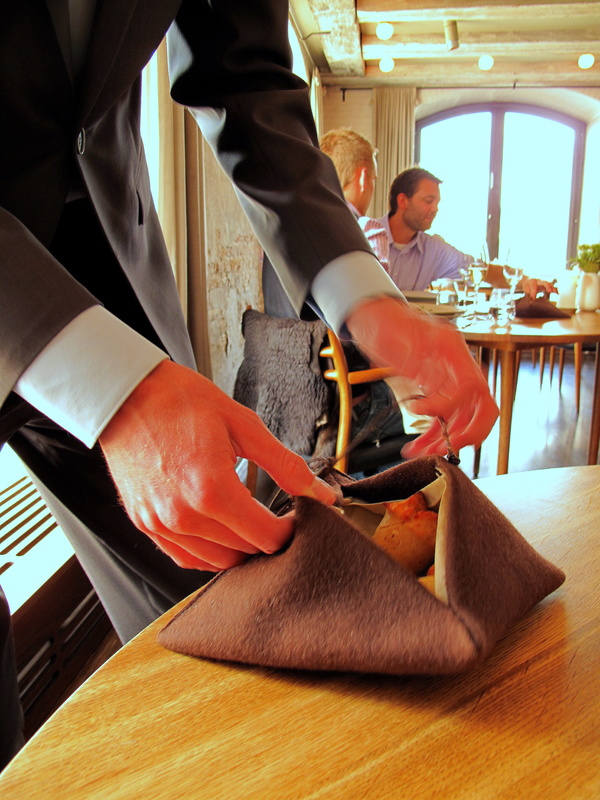 Consequently, one’s meal at noma is about more than only food. 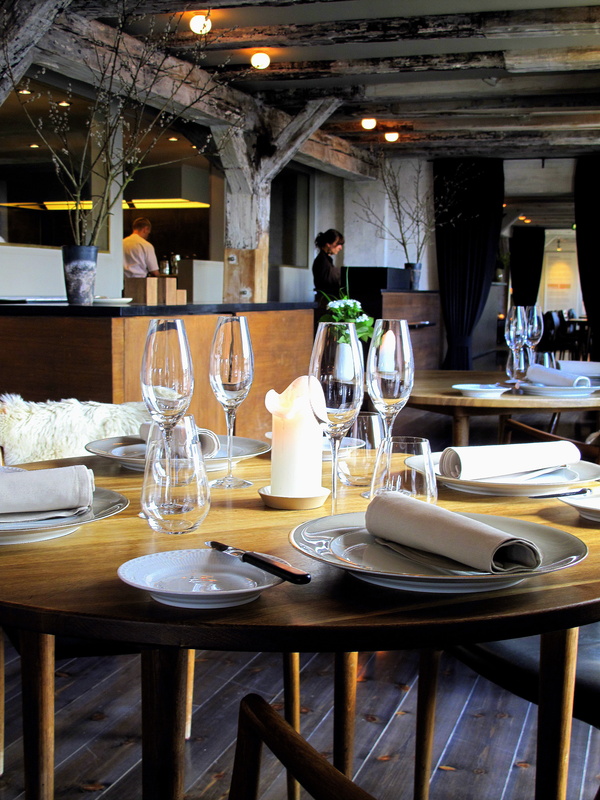 When someone first enters, they are immediately confronted by a décor that although contrary to what one might expect to find at a fine-dining restaurant, is incontestably in keeping with the Nordic ideology. This is then reinforced by the compelling details that are woven into one’s dining, such as the felt bread-holder or the hunting knife that arrives with the main course. However, it is really the people that make being here so special and truly an experience. The staff, as said already, are terrifically keen and interested, but there is the added interaction with the chefs too. Breaking down any imaginary boundaries between customer and kitchen, there is also something very emotive and effective about this approach. Chefs, as they proudly present them before the diner, describe their dishes with the natural affection that the maker has for what he has made – and rightly so. After all, what they are achieving with these is worthy indeed: with each plate, they are giving back Nordic cooking its identity. The consequences of this are not only felt by noma’s guests, but are spread across Copenhagen. 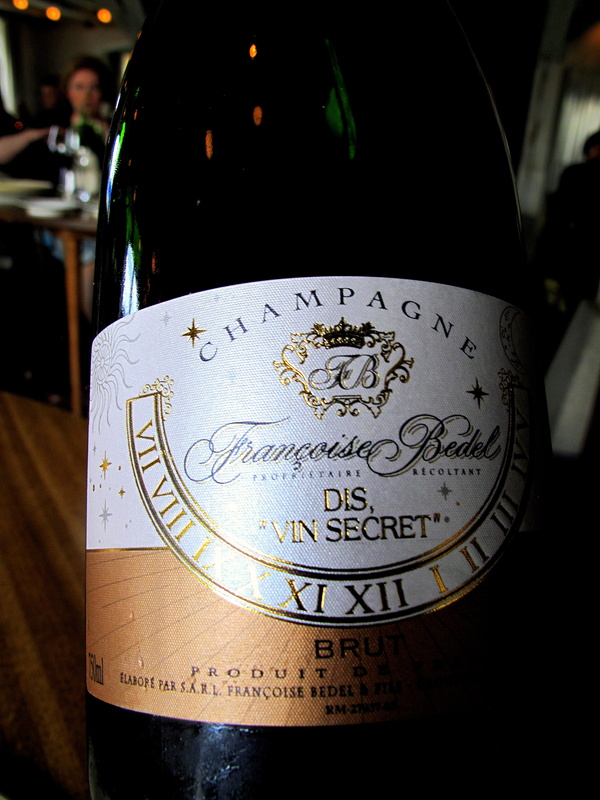 Once derided, now the restaurant is congratulated by critics and colleagues. It is a mutual fondness. There is a tremendous sense of camaraderie between the city’s chefs – not only are they genuine friends, routinely cooking for each other and organising charity events together, but they even share suppliers. 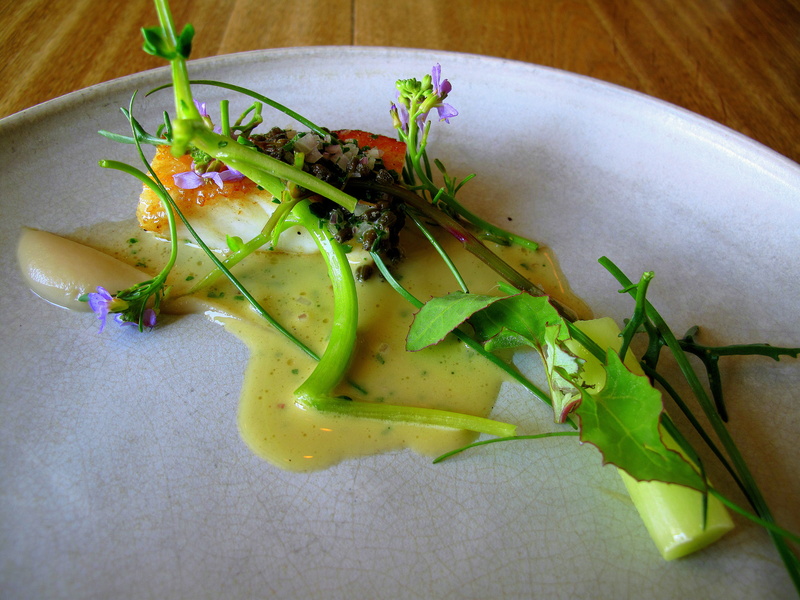 When one discovers a new ingredient/source, he tells the rest; for example, Lammefjord has been referred to as noma’s garden yet everyone uses Søren’s vegetables. 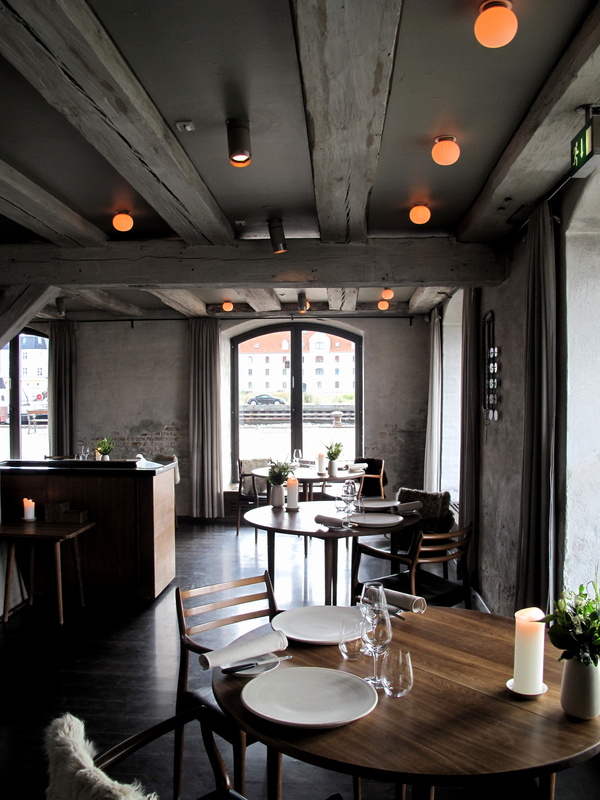 Noma may be Copenhagen’s catalyst and René Redzepi might have set the bar high, but others are rising to the challenge. This is not news per se yet the quality and consistency across restaurants is still (superbly) startling. Eating around the capital, this fraternity and impetus is truely tangible, inspirational and indeed infectious. Parallels have been drawn between Copenhagen and San Sebastián, where in the seventies local chefs created nueva cocina vasca, a cuisine that was motivated by nouvelle cuisine, but remained solidly Basque in character. There too existed this same sense of solidarity and unity with chefs working together – traditional txokos were just one illustration of this in practice. However, recently, the spotlight has swung from Donostia onto other regions; principal amongst these being California and Copenhagen. Even Adrià has conceded that ‘if Spain was the new France in culinary terms, then Nordic must surely be the new Spain.’ This shift is exemplified by a movement from innovation-based cuisine to ingredient-based ones. And it is the latter of the two, which I believe, to surely be the more sustainable. If my praise was not sufficiently purple, be left in no doubt, this was one of the greatest dining experiences I have been fortunate enough to enjoy. 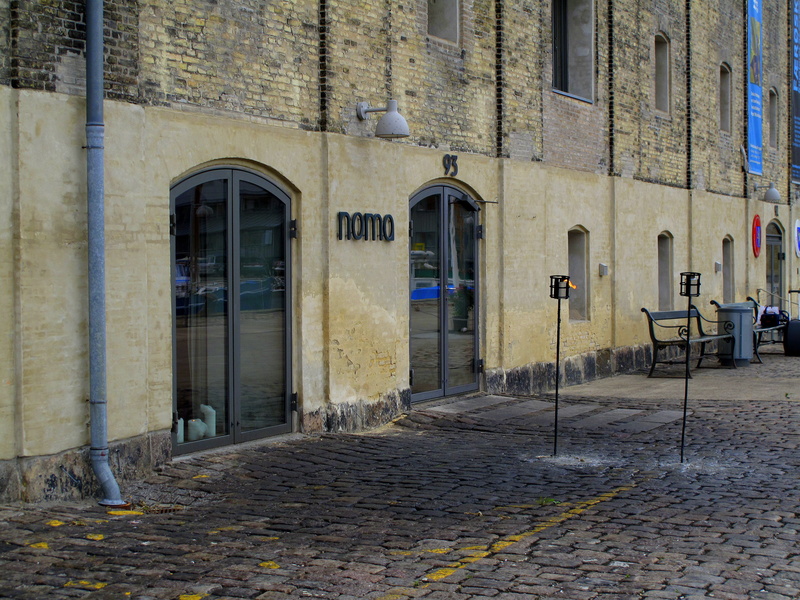 As I floated walked out of noma, I knew I had already been won over by the charming staff, René Redzepi’s delicious cooking and by the potential of Nordic cuisine. 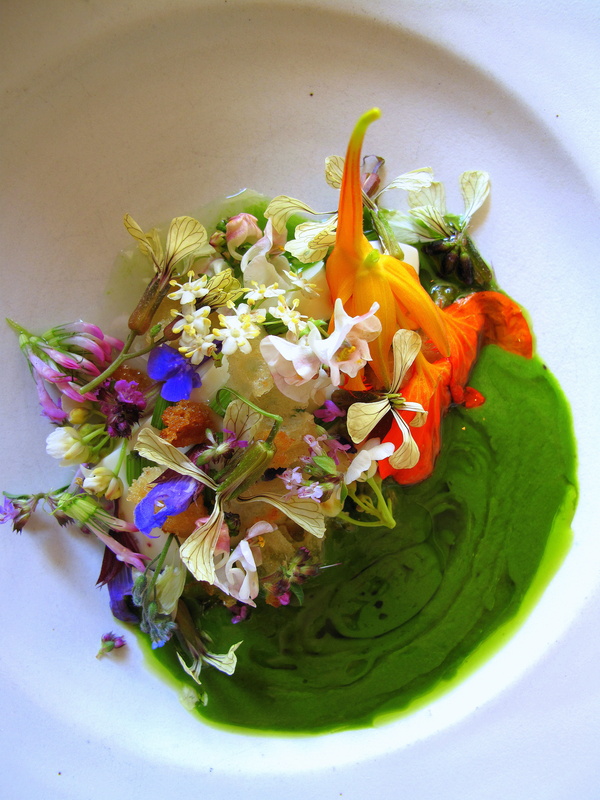 René Redzepi is a magician without tricks. There are few others capable of producing dishes so powerful, poignant and so provocative that they are able to leave one at a loss for words (or at least unable to utter anything but a whimper or whispered wow). Often, as the memories fade, meals are remembered only by a moment or two. 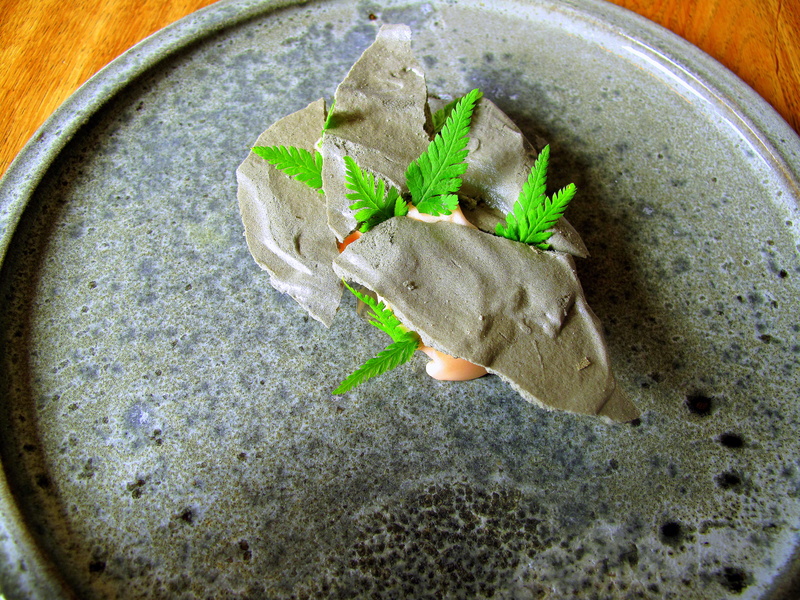 My meal at noma was a meal made of such moments. The moment when the smoke drifted out of the speckled egg shell; the moment that I clumsily clutched my beef and smeared it across my plate; quickly followed by the moment I found myself hunched over my warm pebble, using both my hands to pull apart a huge langoustine. And more, until finally, the moment at lunch’s end when I noticed crumbs of malty-hazelnut earth still caught under my finger nails and giggled to myself – that…well, that was the moment I found my hygge. * Wauw. What a blog you have. You get *** from me. It sounds completely and utterly fantastic. That smoke puffing out the eggshell: amazing. Lovely write-up. A wonderful review that brought back some very happy memories. Although we had almost a completely different menu, the ‘snacks’ seem ever-present! I’m just a little bit sad we didn’t get to try the beef tartar, but I hope to return one day! You are spot on about the staff too, absolutely charming – a special experience. When we were having our coffee in the bar, Lau overheard me say “I don’t want to leave” and replied, “you don’t have to!” I wish. It’s clearly got to you! i thought it looked like a sewage pipe too – kinda cracked me up. the photos are quite nice as some of those colors really pop! Fantastic review of what was clearly a sublime experience. Funnily enough a Danish friend, visiting London on the weekend, invited Pete and I to stay with her in Copenhagen. I haven’t visited since I was a child and Pete not at all so am hoping to take her up on the offer next year. 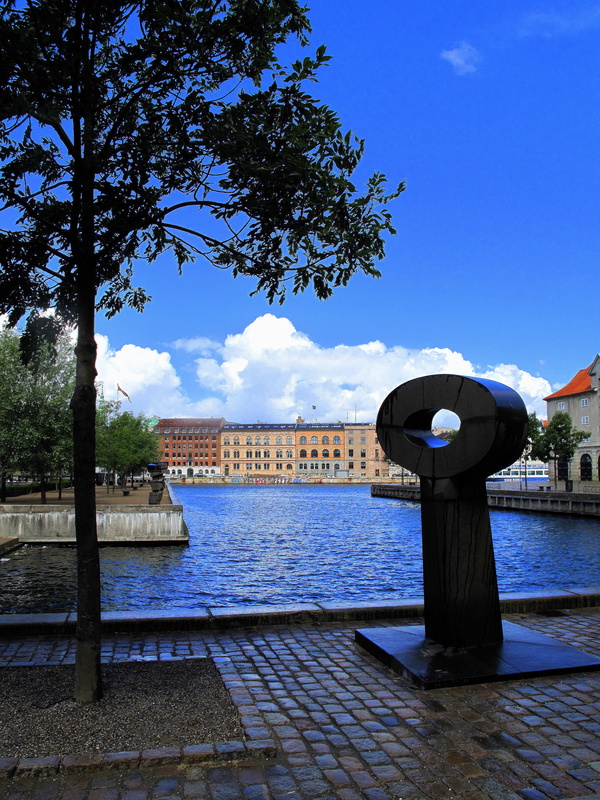 Perhaps a visit to Noma is on the cards! Well, well, well, what an exhausting, but ever so rewarding read! All I can say is thank you, once again, for sharing an experience with us that isn’t all that easy to come by. I have recently been to Helsinki, where I had dinner at Hans Välimäki’s Chez Dominique. It didn’t quite reach the heights you attribute to Noma, but some of the qualities you discussed had been present there as well: a respect and understanding of local produce and a unique style that’s somewhat removed from your typical haute cuisine. Some dishes were absolutely outstanding while others were just good and the service felt a bit distant and cold, but I wouldn’t want to have missed that evening at Chez Dominique. 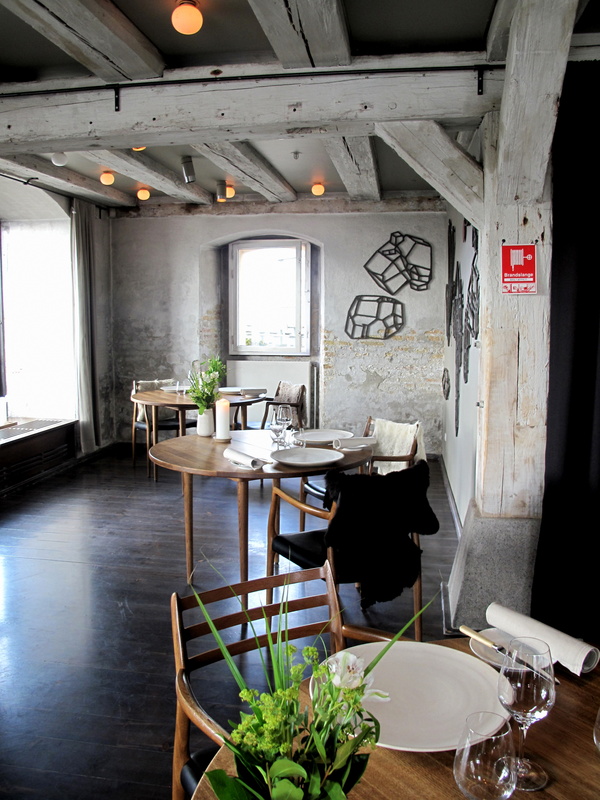 Chef Välimäki’s two stars are much more deserved than some of his German colleagues’. 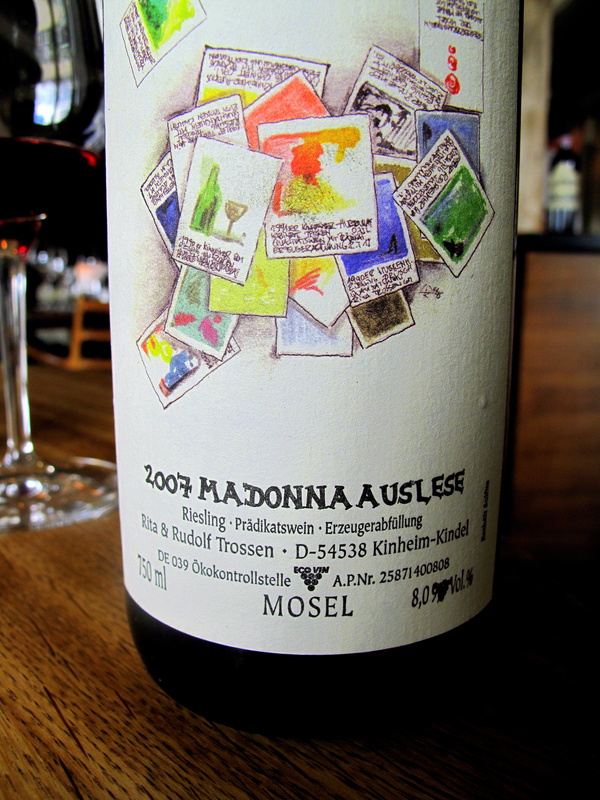 Gastronaut & Michael: You are both making me blush. You’re being far too kind. Robus: Glad you enjoyed it. Almost ever-presents I’d say, but certainly always welcome. Haha. I can’t say enough nice things about Lau and all the staff and chefs too. Actually the hospitality I have found all around Denmark is second-to-none. Actually, the hospitality I have found all around Denmark is second-to-none. Trine said much the same. Archie: Thank you for reading it all (I’m certain you are in the minority!). Chez Dominique does look interesting, especially now, having discovered Denmark. 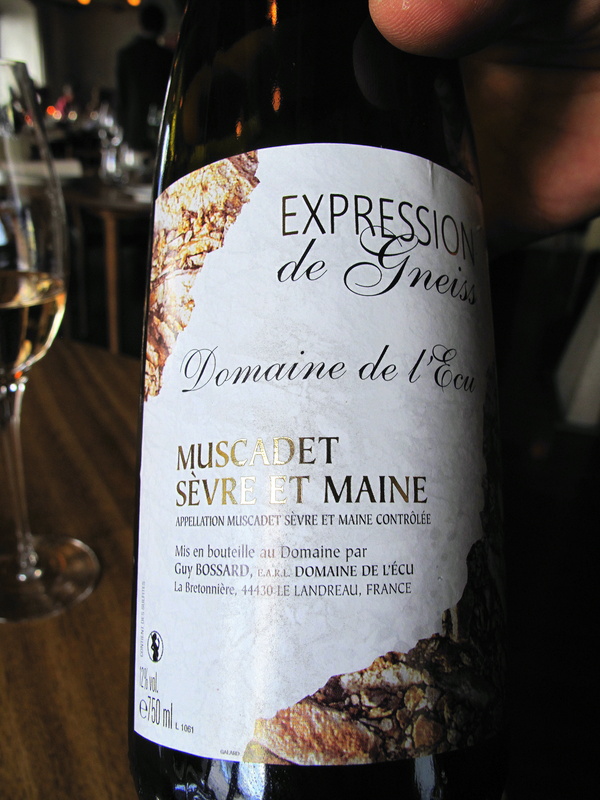 My experiences there have really whet my appetite for tasting more of the region. Fantastic review, and great photos too – what stunning presentation. love your reviews, and always great pictures of food you eat. i am a chef and enjoy reading about the restaurant i work in, and others i have staged at. What a loooong review… But you never go out of breath reading it : the quality keeps your curiosity awake. The amuses-bouche are incredible. Nice job. See u.
I finally manage to read the whole post. And you know what, it wasn’t even hard to stay focused. 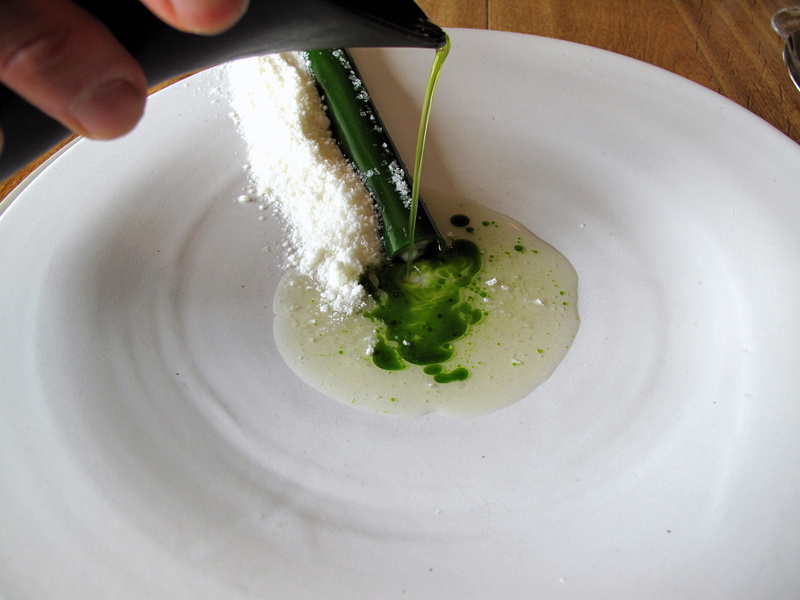 This review is undoubtedly the longest AND the best I ever read about noma. The way that you draw in what is said in the press and from the business and make your post truely contemporary. It’s outstanding in the essence of the word. On a personal note, although I only had three courses (four if counting the amuse) first time I visited noma I felt the same way when I left the restaurant. I even noticed a tear in the eye corner and a lump in my throat when I read the three last paragraphs. Lizzie: Thank you!! The lighting was just perfect. is100: You are cruel, indeed. I too am very fond of that word! Would you rather I used between constantly – wouldn’t that be repetitive. Glad you enjoy the writing though! Thanks. TCP: Merci. That’s very nice of you to say. You are only half-right – it is probably the longest! Nonetheless, your words are truly touching and I am so deeply appreciative. If it were not for Trine, God only knows when, if ever, I would have made it to Noma. Hers was one of the sites that encouraged me to start mine, so to receive such approval from her means a great deal. I urge you all to visit http://verygoodfood.dk immediately – but I warn you to have a napkin ready as her 14(!) 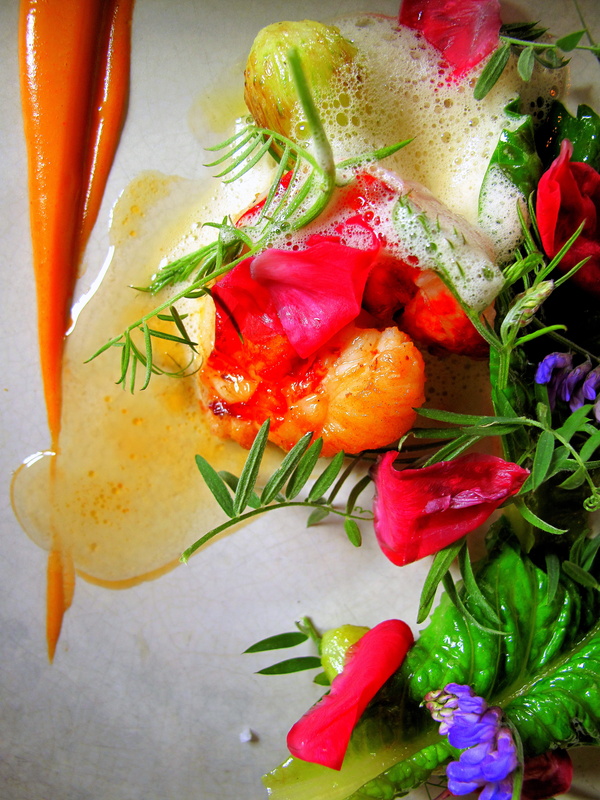 Noma posts, amongst many beautiful others, will have you drooling. Your photos are stunning, and your prose even better. Well done! I ate there last year and if i am being perfectly honest here for just a second, i found that NOMA foodwise was a bit overrated, dont get me wrong, i loved Rene Redzpei’s modern presentation style, but during my meal there i never ever once had a “WOW How The Hell Did He Do That Moment” which you should expect especially considering that NOMA is the place to eat at nowdays for foodies the world over. And also on the day i found that most of the vegetables i had during my meal there were somewhat lacking in the taste department, and they could not hold a candle to what my sister even grows in her back garden, as for how i would score NOMA foodwise on the day, i personally would give it a very very very low 7 out of 10 mark IMO. It’s disappointing to hear the restaurant did not have a similiar effect on you as it did on me. Do the dishes we shared look the same or have they been changed/bettered since your visit? 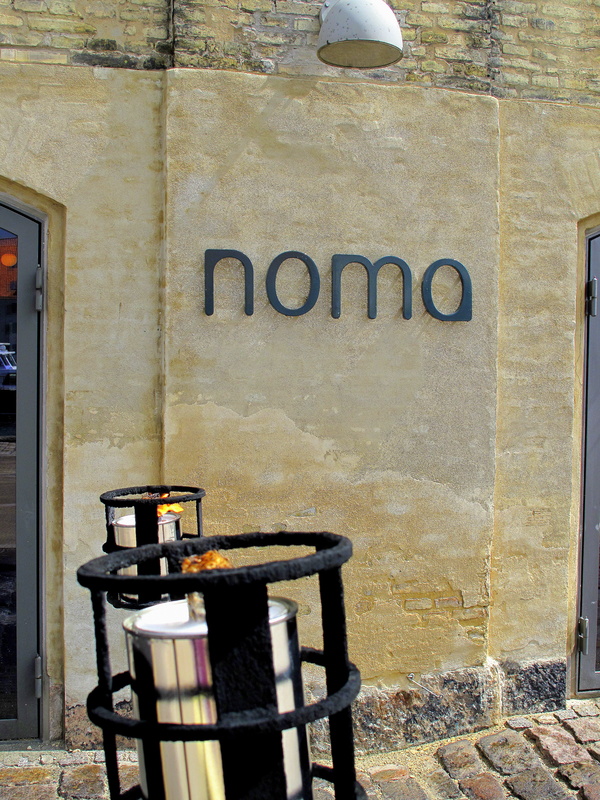 A few friends who have eaten here recently have also been impressed, so maybe noma has improved? I will not write the place off just because taste wise it did not happen for me during my visit, mabey i just caught them on a bad day, because it has happend to me before with the most recent one being Le Manoir Aux Quat Saisons. And Raymond Blanc’s place is famous for it’s vegetable garden, yet the ones i ate during my meal were not as good a quality as i had before on a previous visit, i guess if you rely on nature for much your produce you really are at her mercy, as for the dishes from what i can remember, some are the same and some i have not seen before mate. Yes they do and David Everitt-Matthias serves some of the more intresting high end food in this country, and when he is on fire in the kitchen his food is as good as anybodys i have ever eaten in England including the FD. But the only thing that stops him from getting his 3rd michelin star is the decore in the restauarnt, because it looks like Clarice Cliff decorated the place while on an acid trip, P.S you should also try Whatley Manor sometime aswell, because the head chef Martin Burge is definitely a name to look out for in the future IMO. Thanks for the tip. I only know of Burge by name. I recently came across your blog and have found it fascinating – you seem so enthusiastic, eager and passionate about your food. 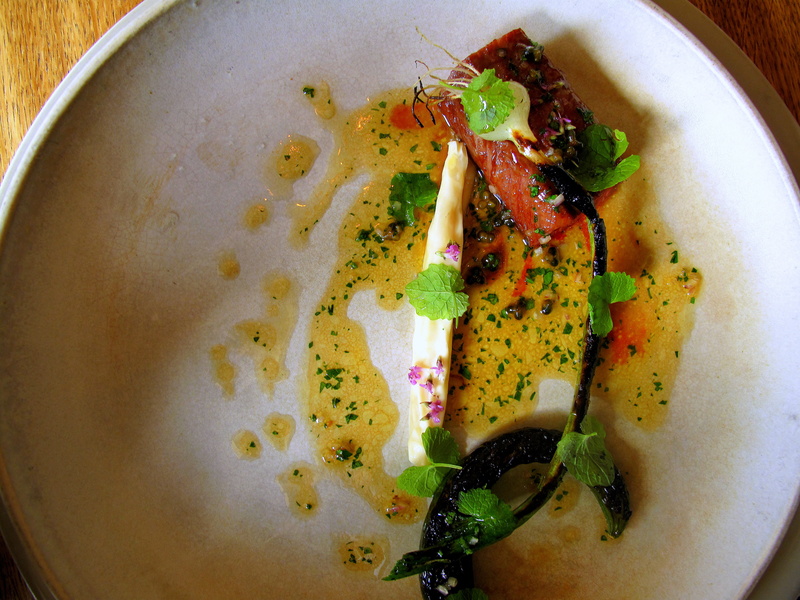 Your review of Noma is a magnum opus. I would like to recommend a restaurant which I’m sure will be very much to your tastes. I travel a lot and while in France recently visited Alexandre Gauthier’s La Grenouillére in Montreiul-sur-mer which has one Michelin star. 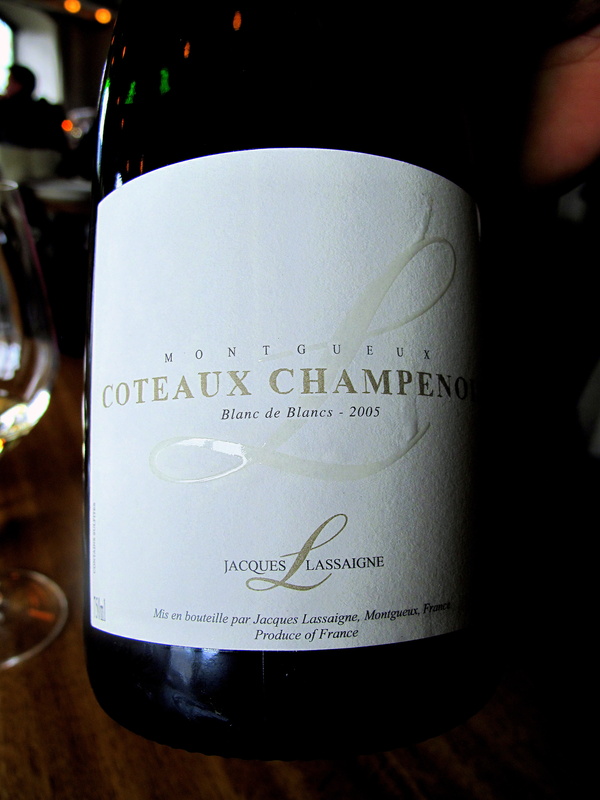 The menu is constantly changing but the cuisine is very much an expression of Mr Gauthier – gentle, appealing, disconcerting, full of contrasts and a bit untamed. Thank you, Zoltan. That is especially nice of you to say. If I had to pick a restaurant to whom to attribute my best post, I would be happy for it to go here. 🙂 One step ahead of you. I have tried Alex’s cooking (although not at la Grenouillére – YET) and have been impressed already! You’re right though, his dishes are direct, bold, a little wild yet natural and tasty. His potential is immense. This is one of the better articles. Also a great description of why someone should eat their.